Called to order: Allen B called the meeting to order at 7:00. Motion by Kevin to accept the February minutes except 1 item in new business that the trustees would sign the signature card. Changing it to be just the President, Vice President, the church secretary and the treasurer. It only needs 2 signatures. It was seconded by Lacie. Motion carried. The Treasurer's report was reviewed and approved checks 11332-11362. Motion by Keith, second by Mike, motion carried. Pastor was not present so no Pastor's report was heard. It was discussed that the bathroom by Pastor's office will be painted. Motion to remove Mindy Piersol from the memorial fund account and to put on Kevin Reich and Sue Knutson. Scholarships for youth at graduation was tabled for later. Motion to have Pastor order the student bibles for confirmation using the memorial fund. Motion by Kevin, second by Mike. Motion carried. Motion by Sue to have a smaller cake and/or cupcakes for confirmation and first communion. Second by Lacie. Motion carried. Questions were asked by Kevin about the bylaws. Discussion was made. By next meeting all council members should read the bylaws so they can be gone over and updated if needed. Motion by Sue to add 1 council member (Mike) to the board of trustees so there are 5 instead of 4. Second by Keith. Motion carried. Meeting was adjourned with the Lord's Prayer. Minutes submitted by Sherry Largis. Call to Order: Allen B called the meeting to order at 7:30. Pastor Graff opened with prayer and devotions. Trustees – the elected officers listed above. Deacons – Allen Bertilrud, Ed Dahle, Kevin Harmoning, Sherry Largis (chair) and Brook Rufsvold. Board of Ed/Youth – Cristin Gums (chair), Lacie Hovland, Sherry Largis, Mike Seeger, Shellby Baird and Mariah Peterson. Exterior Committee – Allen Bertilrud, Cristin Gums, Cheryl Matzke and Mike Seeger (chair). Interior Committee – Kevin Harmoning, Lacie Hovland, Keith Leines (chair), Mike Seeger, Shellby Baird and Mariah Peterson. Parsonage – Ed Dahle, Sue Knutson (chair) and Brook Rufsvold. The January minutes were reviewed. Motion by Keith, second by Cristin, approved. The Treasurer's report was reviewed and approved checks 11311-11330. Motion by Cheryl, second by Keith, approved. Revelation Bible study has two more sessions left. Very in depth study. As many as 13 have been in attendace. The resource used for the study is a video based lecture series given by Craig Koester of Luther Seminary. This was provided by Allen Bertilrud. Thanks Allen! First Communion Class for fifth and sixth graders starts on Sunday the 24th of February. We should have as many as nine kids in the class. Our “Witnesses!” confirmation event was cancelled due to weather and will be rescheduled sometime this spring. This coming Wednesday, confirmation and youth group will be serving a meal at the Care and Share Homeless Shelter in Crookston. Baptism for Ames Gagner, son of Ashley and Aaron Gagner. Prayer Shawls made by Carolyn Roff and blessed by our women's Bible study have been deeply appreciated by people hospitalized or recovering from illness or surgery. So far we've given out about 11 in just the past few months. $865 was taken in at our “Sundae Sunday” celebration. This was raised for Northland's Rescue Mission in Grand Forks. TRF Spring Conference Gathering Thursday, Feb 28th at 7:00 pm at Zion Lutheran. All council members invited to attend. Lent starts with Ash Wednesday on March 6th. Had a strong request for a Good Friday service last year so we will have it, big crowd or not. It was decided to discuss natural gas conversion later in the spring. The council contact sheet was corrected and updated. It was decided that all of trustees would sign the signature card. Motion by Kevin, second by Cristin, approved. The February Benevolence of $1,000 will be given to the Care and Share Center in Crookston. Motion by Keith, second by Brook, approved. Lacie and Brook volunteered to co-chair the Sunday School Superintendent position. It was discussed the need to order more keys for the church. Pastor will take care of the ordering and dispersal of the keys. The Confirmation banquet was discussed. The budget is $300 and the tentative date is May 5th. Lacie and Brook will handle the arrangements. Per request, Pastor will participate in the Lenten sermons series with the TRF conference pastors. Motion by Brook, second by Keith, approved. It was approved to allow the Girl Scouts to set up a table in the fellowship hall to sell their cookies. Future requests of this nature will be discussed on a case-by-case basis. Motion by Lacie, second by Cristin, approved. Minutes submitted by Cheryl Matzke. The Annual Meeting was called to order by Council President Allen Bertilrud, on January 20th, 2019 at 12:02 p.m. The roll call sheet was distributed for members to sign and is on file. The meeting began with devotions led by Pastor Gary Graff. The minutes from the January 21st, 2018 annual meeting and the reports of the various church committees were distributed in the Annual Report. Motion to approve the minutes as submitted and to dispense with the reading of the committee reports was made by Harvey Bakke, 2nd by Linda Johnston, motion carried. Pastor's Report was submitted in the Annual Report and focused on how the people of Bethany Lutheran Church make a difference in the community and the world. He also included a thank you to outgoing council members Gerald Bjorgan, Lorri Ann Hartel, Darold Johnston, Ann Piersol, and Jenny Schmitz. Congregational President Allen Bertilrud's Report was submitted in the Annual Report and focused on the benevolence seen within our congregation over the past year. He also mentioned how Pastor Graff reaches many people outside of our congregation through acts such as baptisms, weddings, and funerals. He thanked Pastor Graff and his wife Linda for all they do for the church and the community. Presentation of Budget for 2019: The proposed budget shows an overall increase of 1.4% and includes an increase in Pastor Graff's wages to bring him up to the recommended Synod level. Motion to approve the Budget for 2019 made by Linda Johnston, 2nd by Chris Van Emmerik, motion carried. Election of Council Members: Kevin Harmoning, Lacie Hovland, Cheryl Matzke, and Brook Rufsvold were added to the ballot, as well as Shellby Baird and Mariah Peterson sharing a youth representative position. Motion to cast a unanimous ballot was made by Kevin Reich, 2nd by Gerald Van Emmerik, motion carried. Benevolence 2019: Suggestions for benevolence were requested and will be passed on to the Trustees. It was noted that WELCA may be able to help with benevolence shortages sometime this summer if their budget allows. One suggestion was for a “Food Shelf Sunday” once a month with the focus on paper products and toiletry needs rather than canned goods. Another suggestion was to once again support Bethany youth as they begin fundraising to attend the National ELCA Youth Gathering in Minneapolis in 2021 with a benevolence donation each year for the next three years. Other Business: A suggestion was made to look into the possibility of replacing the front doors of the church, with at least one of them being handicap accessible. Due to the vast expense of this, fundraising will be required and may take a few years. The council will consider this. Meeting was adjourned at 12:14 p.m. with the Lord's Prayer. Minutes submitted by Destiny Kuznia. Call to Order: Keith L. called the meeting to order at 7:30 p.m. and Pastor Graff opened with prayer and devotions. Minutes: The December minutes were reviewed. Motion by Jenny to approve the minutes after taking out the phrase “and switched over” in regard to natural gas. Seconded by Mike, motion carried. Treasurer’s Report: Motion by Gerald to approve treasurer’s report including checks 11296-11308 and debit card transactions, second by Mike, motion carried. Pastors Report: Pastor will begin a bible study on Revelation starting 1/13/19 at 7:00 p.m. Confirmation reports were sent to parents with update on fulfillment of requirements. Confirmation is tentatively set for May 5th. With a smaller class he’s having trouble getting volunteers to serve snack and provide second adult supervision. A mass email was sent to the congregation with a good response. Working on getting 5th and 6th grade first communion classes started and date set for first communion. Linda Johnston, Hannah Seeger and Alison Lacina are taking over 7th and 8th grade Sunday School class. The four month unit Pastor did on Sexuality and Dating went well. It was noted by a parent volunteer that the material used is rather dated although the topics presented are still relevant. Pastor will look at what updated curriculum may be available for this topic. Sundae Sunday is being planned for 2/3/19. Basket raffle and meal are being planned with proceeds going to the Northland’s Rescue Mission in Grand Forks . Thrivent Action Team is helping with this. Also a Thrivent Action Team is being used for the youth group to prepare and serve a meal at the Care and Share in Crookston as well as provide personal hygiene products to the residents. Items for Discussion: Pastor shared a Save the Date with council members. Conference two will be presenting “Witnesses” presented by Jonathan Swenson of Paraphrase Theatre on February 6, 2019. Great opportunity to hear a good presenter. They are looking for congregations in conference two to contribute to the cost of bringing the speaker in. Motion by Sue to donate $200.00 benevolence to offset cost of event, second by Mike, motion carried. Natural Gas Changeover: Has not been done yet. Keith L. has contact Dean Adams to do this and will be following up with him. Propane tank is getting dangerously low so may need a partial fill. Keith will monitor. Replacement Council Members: Lacie Hovland, Brooke Rufsvold and Kevin Harmoning have all agreed to have names on the ballot. We also have two youth who are willing to run and would collectively hold one position. They are Mariah Peterson and Shellby Baird. We still need one more name for the ballot. Budget: Sue Knutson reviewed the 2018 budget and the proposed 2019 budget. The Trustees recently met and made a proposed 2019 budget which was presented and discussed. A motion to recommend budget as presented to the congregation at the annual meeting was made by Jenny and seconded by Cristin, motion carried. In discussing budget the council discussed church secretary position. A motion was made by Mike to give a 3% increase to this position for 2019. Second by Ed, motion carried. Benevolence: January Benevolence was discussed. Sue motioned to donate 200.00 to conference two for Witnesses Event, $500.00 to LSS Senior Meal Site in Red Lake Falls and $300.00 to Violence Intervention Project in Thief River Falls. Second by Ann, motion carried. Business Items for Annual Meeting: Get committee reports to Destiny as soon as possible. Pastor thanked outgoing council members for sharing their time and talents. Meeting adjourned with the Lord’s Prayer. Minutes submitted by Jenny Schmitz. Call to Order: President Allen B. called the meeting to order at 7:30 p.m. and Pastor Graff opened with prayer and devotions. Minutes: The October minutes were reviewed. Motion by Jenny to approve the October minutes as written. Seconded by Darold motion carried. Treasurer’s Report: Motion by Sherry to approve treasurer’s report and checks 11260-11295, second by Cristen, motion carried. Pastors Report: Assisted with three funerals for 1st Presbyterian Church this fall. There’s been only one funeral in 2018 at Bethany. Pastor has done 8 weddings this year. Now using Symbis pre-marital counseling which Pastor is certified to administer. Continuing Ed topics participated in deal with increased sensitivity and understanding of diverse cultures. Confirmation is one session of 7th and 8th combined which is going well. November council meeting was cancelled due to members unable to attend. Evening in Paris was a huge success which raised over $3000.00 for the Sonshine Ministry. Our youth group did a great job helping with this. Walk Through Bethany was held at Bethany showcasing manger scenes. Special music provided by Rachel Largis. Sunday school program is this Sunday with meal after by youth group. Christmas for Kids night is being planned at Bethany on December 23, 2018. Pastor will be holding a class this winter on the book of Revelation. Items for Discussion: Discussion on stewardship and how to better reach out to people. Try encourage people to sign up for auto payment. Also, discussion on how to get people more involved and back to attending church. Discussed sending out short text messages once in a while with upcoming activities (i.e Lighthouse will be performing this week, communion this week). Also discussed having one Wednesday night per month as family worship and have a meal. This was done a few years back and was well received. Benevolence: Discussion about benevolence and other ways that we are doing this such as Sonshine ministries, use of our building, use of our Pastor, and quilts just to name a few. Motion by Jenny to table the benevolence of $1000.00 for this month due to current financial status. Natural Gas: We are now signed up and switched over. Replacement Council Members: There are five member going off council. Discussion on recruitment of new members and desire to have recent confirmed student members on the council. Members will reach out to others and ask if they are interested in serving our church in this capacity. Call to order – President Allen B. called the meeting to order at 7:30 pm and Pastor Graff opened the meeting with Devotions. Minutes – The minutes September 12, 2018 were reviewed. Motion by Sue to approve the minutes, Darold seconded and the motion carried. Treasurer’s report – Motion by Keith to approve check numbers 11251-11259, Gerald seconded the motion and it carried. The financial report was reviewed. Parsonage - The egress window is in. Bob Klipping did the work and an invoice will be coming. Pastors Report – Pastor Graff noted Bob Klipping is just about done with egress window in the parsonage basement. The sound board is repaired and should be back in service by a week from Sunday. He did the funeral for Marion Keifenheim on Sept 28 and wedding for Seth Schmitz Sept 29. Youth will be going bowling on Sunday. Gideon Sunday will be Oct 14. Thanksgiving service will be held at the Presbyterian Church this year. We have 11 youth in confirmation and he is having one class. He noted a huge thank you to all the helped and attended the Laurie Duden benefit. Benevolence – It was decided to delay the $1000.00 donation another month due to low funds. Discussion took place on how our church is giving benevolence in many ways such as sponsoring events and donations to good causes. Natural gas - Keith will be watching the tank and will take care of the changeover to natural gas. Pastor Graff suggested we give our two main lawn mower guys (Jim G. & Harvey B.) a gift of appreciation. It was decided that Pastor will purchase thank you cards and $50 gift cards to Eagle Square for each of them. Thank you also to all those that help with the lawn. Transportation for shoe boxes has become quite expensive as the cost is approx. $9.00 per box. We will make sure that those that take a box are reminded of this cost. Last year Bethany packed approximately 100 boxes. The meeting was closed at 8:15 pm with the Lord’s Prayer. Attendants: Allen Bertilrud, Gerald Bjorgan, Sue Knutson, Jenny Schmitz, Cristin Gums, Darold Johnston, Ann Piersol, Ed Dahle, Sherry Largis, Pastor Graff, and Keith Leines. Meeting called to order by President Bertilrud with opening devotions by Pastor Graff. July minutes read, motion carried by Jenny Schmitz to approve, second by Darold Johnston, motion carried. Treasures report read and discussed with concerns on lack of donations and short comings on reaching benevolence goals. Motion to approve treasures report by Gerald Bjorgan, second by Sherry Largis, motion carried. Pastors report given. No committee reports. Old Business: Likes by all on scripture reading platform. Survey results discussed; does coffee hour really need treats? Looking for suggestions to involve youth in worship service. New Business: Looking for ideas for August/September Benevolence. Motion made by Sue K with second by Sherry L to suspend August/September Benevolence, motion carried. Interior Committtee to get firm prices on natural gas change over. Exterior Committtee to get numbers to budget for new riding lawn mower. Motion to adjourn. Meeting closed with the Lord's Prayer. Call to order – Treasurer Sue K. called the meeting to order at 7:30 pm and Pastor Graff opened the meeting with Devotions. Minutes – The minutes dated June 13, 2018 were reviewed. Motion by Jenny to approve the minutes, Darold seconded and the motion carried. Treasurer’s report – Motion by Darold to approve check numbers 11209 - 11220, Gerald seconded the motion and it carried. The Board of Education will be meeting in August. Parsonage - The egress window will be put in soon. Pastor Graff will take care of this. Interior Committee – Still working the panel situation. We are not quite sure which way to go and the cost. Exterior Committee – the Handicap sign is in place. Pastors Report – Pastor Graff thanked the crew who led Vacation Bible school this year. He also thanked Kevin R. for leading service when he is on vacation. Bruce, Harvey and Jim have been taking care of the church lawn this summer. A huge thank you to them also. Pastor Graff noted our church credit card number was recently stolen by an individual from California. The card has been cancelled and new passwords will be created. Youth Update – Jenny gave an update to the council noting the trip to Houston was wonderful. All 14 kids were great! The music and message were fantastic. Our group had a lice incident which was taken care of by a professional but was quite costly. Jenny reviewed the expenses for lice treatment. Motion by Sue to reimburse Jenny and Nancy for their costs for lice check and treatment up to $300.00, Darold seconded the motion and it carried. It was noted if the families have a hardship paying for lice checks and treatment, the Trustees will re-visit this. Damaged office equipment – We lost our projector during our last storm. Sue will investigate the insurance for this as we have a minimum of 16 hours labor in fixing, etc. and the cost for the projector is approximately $1300.00, Motion by Darold to purchase a new projector, second by Cristin and the motion carried. July 29 – Darold Johnston & ? Lorri Ann put an email out to the church council requesting volunteers to count money. The meeting was closed at 8:40 pm with the Lord’s Prayer. Call to Order: President Allen B. called the meeting to order at 7:30 p.m. and Pastor Graff opened with prayer. Minutes: The May minutes were reviewed. Motion by Ann to approve the May minutes as written. Seconded by Mike motion carried. Treasurer’s Report: Motion by Jenny to approve treasurer’s report, second by Mike, motion carried. Pastors Report: Thanks to Allen and Sandy Bertilrud for attending the Synod Assemble. Pastor presided over the Amanda Myhre and Michael Dailing wedding last weekend in Horace. Many Red Lake Falls people and Bethany friends were in attendance. Vacation Bible school is planned for July 9-12. Helpers are still needed. Contact Peggy Miller or Linda Johnston for more information. Thanks to Jim and Harvey for keeping the lawn up and also to Bruce Piersol and Darold Johnston who have also been helping. This Sunday will be “Send Off” Sunday for our youth going to the Gathering in Houston Texas. We will have special prayers and sermon tailored to the occasion. We are very thankful for our youth and leaders for their hard work on this very ambitious project. Lighthouse will be leading us in songs that will be sung at the Gathering. Thank you to all who cleaned up the church on “Church Clean Up Sunday”. It worked wonderfully well! We got the windows washed, pews straightened and got rid of one pickup load of junk to the junkyard. Thanks to all who attended and worked so hard. Old Business: Handicap parking sign needs to be put up. Continue to work on choir and song leaders. Interior Committee will continue to research soundboard options for the Parish Hall. Types and prices will be explored. Roller for the lawn will be dropped off at church soon. Benevolence: Motion by Mike second by Darold to donate $500.00 to the Seminary Scholarship and $500.00 for special offering at the ELCA Youth Gathering for the June Benevolence. Motion carried. Natural Gas: We are now signed up to be connected sometime this summer. Vacation: Pastor Graff will be on vacation June 21-28. Kevin Reich will be our supply preacher. Pastor Carl Hanson will be officiating at the wedding for Krystina Hicks and her fiancé while pastor is on vacation. Parsonage Committee: No longer need an egress window in the basement. Would like to look at asphalt or cement on the parsonage driveway or new lighting in the basement. Pastor will get estimates for both and the parsonage committee will review and make recommendations. Pastor also bought a new faucet and will install himself. Also, on whirly bird type vent on the roof needs to be replaced. Pastor will check with Scott Larson for this. Beacons Duties: Beacon leaders are having trouble filling the Sunday duties each month. Discussion on possible changes/training needed. Council will continue to explore ways to improve this process. Other: Open discussion on weekly scripture readings. Motion by Darold Second by Ann to have only one scripture reading each Sunday that pertains to the message. This will be a trial basis during the summer months. Motion Carried. Acoustic & Noise reduction report - Bruce Piersol gave a short presentation in regard to the acoustics in Bethany’s meeting area. He has been working with Tom from the company Acoustical Surfaces out of Chaska. This company works with acoustics, sound proofing and noise and vibration control. Bruce presented 2 options to the board and gave approximate cost. It was noted this is not in the budget but Pastor Graff suggested we could possibly do ½ in 2018 and the remaining in 2019 to help split up the cost. Another possibility is to ask for special donations for this project. We have two options to look into. It was decided to send this to the Interior Committee to look into further details and options. We will re-visit this project next month. Minutes - Secretary Lorri Ann read the minutes dated April 11, 2018. Motion by Sue to approve the minutes dated April 11, 2018, Mike seconded and the motion carried. Treasurer’s report – Motion by Darold to approve check numbers 11178-11193, Keith seconded the motion and it carried. Pastors Report – Pastor Graff noted Senior Recognition Sunday will be May 20. We have 11 seniors in our congregation. The confirmation banquet and service was well attended. Thank you to Steve Philion for being our guest speaker. Steve has donated his fee to the youth group. The dollars are to be used to pay it forward. The Michael Kline wedding went well and was held on April 21. Pastor Graff attended a workshop in Fargo. It was on hospitality and welcoming people into our congregation. He attended the Concordia Corporation meeting on April 27. Allen Bertilrud will be appearing on the ballot at our upcoming Synod Assembly on June 8-9. Old Business – Handicap parking will be taken care of once the frost is out of the ground. Reminder to all if interested in singing in a special choir, talk to Bruce P.
Benevolence - Motion by Mike to donate the May Benevolence of $1,000.00 to the Northwest Synod, Sue seconded the motion and it carried. Prayer Chapel – Motion by Jenny to approve the ladies group to fix up one of our Sunday school rooms to be used as a prayer chapel noting the room can be used for other reasons if needed, Sue seconded the motion and it carried. Natural Gas for the church was discussed. Motion by Sue to have Pastor Graff continue with this project noting the conversion cost can be $150 - $500. He will call the company and get this done. Mike seconded the motion and carried. Spring Cleaning – it was decided to possibly hold June 3 as spring cleaning Sunday. The congregation will be asked to help. Smoothing church yard – Sue will look into the possibility of getting a small roller to do this. Mid-week summer church service – Motion by Lorri Ann to discontinue this due to lack of attendance, Jenny seconded the motion and it carried. Summerfest outdoor service – Pastor will be on vacation so we will not participate with this in 2018 but we would like to hold an outdoor service one Sunday this summer. Youth Update – Jenny gave an update to the council noting they are very close to reaching their goal. Blow in insulation – Motion by Mike to spend up to $1000.00 for Blow in insulation, Darold seconded the motion and it carried. Call to order – Vice President Keith L. called the meeting to order at 7:30 pm and Pastor Graff opened the meeting with Devotions. Minutes - Motion by Lorri Ann to approve the minutes dated March 14, 2018, Mike seconded and the motion carried. Treasurer’s report – Motion by Darold to approve check numbers 11164-11177, Gerald seconded the motion and it carried. Pastors Report – Pastor Graff noted next year we will have Maundy – Thursday service and also Good Friday service. Approximately 25 attended the Thursday service this year but he feels we need a service on Good Friday also. It was mentioned that we should look into a daytime Good Friday service next year. There are a total of 8 confirmands this year and a supper at Bethany will be served by the Deacons on Sunday, April 15 and confirmation will take place on April 22. Steve Philion will be the speaker at the meal and he has donated his speaking fee to the youth group. Pastor Graff noted that a second traditional choir would be awesome for Bethany. Bruce P. is looking for volunteers. If this works out the choir will sing once a month. A thank you was given to Chris V. for the meatball dinner and basket event. A nice sum of money was raised for Bible Camp. Old Business – Recap of Jeannie Rains visit in March. Insulating the attic will happen soon. Handicap parking is being worked on. Benevolence - Motion by Mike to donate the April Benevolence to Lutheran Disaster Relief earmarking the dollars to go to Syria, Darold seconded the motion and it carried. The Synod Assembly will take place at Concordia on June 8-9. Pastor is looking for two volunteers to attend with him. Natural Gas for the church was discussed. We are going to check on the cost for converting the furnaces. Pastor Graff will call Cole Seeger to see if he can give us an estimate on the conversion cost. Spring Cleaning – The Interior Committee will follow up with this and possibly contact the youth for help. It was noted this would be a good way for the youth to say thank you to Bethany for helping with their upcoming youth rally. Meeting called to order by President Allen Bertilrud. Jeanie Rains made a presentation on where your offering goes/mission interpreters. Secretary Minutes for the January/February meetings were read. Motion to accept the minutes as is was made by Jenny and 2nd by Keith. Motion approved. Treasurer’s Report: The treasures report was discussed. Motion made to approve checks was made by Keith and 2nd by Darold. Motion approved. Pastor’s Report: Approved as read. Youth Group request for $1,000 donation to their fundraising efforts to attend the ELCA National Youth Convention in Texas this summer. Motion was made by Mike, 2nd by Darold. Motion approved. Women of Today Easter Egg Hunt request for donations. Tabled. Motion by Darold Johnston to nominate Allen Bertilrud for President, Lorri Ann Hartel seconded the motion and it carried. Motion by Sue Knutson to nominate Keith Leines as Vice President, Darold Johnston seconded the motion and it carried. Motion by Keith Leines to nominate Lorri Ann Hartel as Secretary, Jenny Schmitz seconded the motion and it carried. Motion by Sherry Largis to nominate Sue Knutson as Treasurer, Ed Dahle seconded the motion and it carried. Minutes - No minutes were available for January. Treasurer’s report – Motion by Jenny to approve check numbers 11132 - 11145, Darold seconded the motion and it carried. Sue reviewed the financials with the board. Pastors Report – Pastor Graff noted this is an exciting time as we are at the start of Lenten season. He reported on cancelling the fifth grade communion class due to a small number as we only have 2. They will have it next year when we can combine with class of six for a total of 8. He has volunteered to host the Spring TRF Conference gathering on Feb 25th at 2 pm. The date has been set for April 22 for confirmation. Youth Group - Jenny gave a financial update to the council and noted on March 18th they will have a Pancake breakfast fundraiser at the American Legion from 8 am – 1 pm. Old Business – Insulating the attic will happen when we thaw out. Handicap parking is being worked and the dishwasher is down but this is being looked at also. New Business – Committees were assigned for the New Year. Benevolence – Benevolence in the amount of $1000.00 for February was given to the Care and Share Center. Note from Pastor Graff via email - Since we often make a Benevolence donation to Care and Share, Darold Johnston suggested that we make this our February Benevolence commitment and contact you via email for approval. This isn't the ideal way of doing business, but it is an opportunity to make our money go further and support a ministry we often make donations to. Care and Share was also one of the suggestions given for benevolence commitments at our Annual Meeting last month. The vote was YES. Committees for 2018: The Council selected the committees for 2018. The meeting was closed at 8:05 pm with the Lord’s Prayer. Meeting called to order by President Chris Van Emmerick. Devotional lead by Pastor Graff. Secretary Minutes for the December meeting were read, Motion to accept the minutes as is was made by Mike and 2nd by Gerald. Motion approved. Treasurer’s Report: The treasures report was discussed. Motion made to approve checks number 11115 to 11121 was made by David and 2nd by Keith. Motion approved. The 2017 budget was reviewed. Christmas Eve Service was well attended and had positive feedback, as was the December 31,2017 service. Thank you to Keith Leines for adding the lock shield and other repairs. Sunday Sundae will be February 11. Congratulations to Destiny and Jarvis Kuznia on the birth of their son. Destiny will be taking a few weeks off and return half time for a while. Confirmation is going well. One area of concern is the Black River group as we have no-one to take care of sermon note. Black River also does not have Sunday School for their teens so the kids are making up for that by helping with the younger group. There is one of our eighth graders falling behind. I am trying to work with them to get caught up. Snow removal is going well, Brad and Mason Johnson have even cleaned out the parsonage driveway at no charge, big thank you!! February 25th from 2-4pm the Spring Conference gathering for the TRF district with be held at Bethany. We will be serving coffee and cookies. Should be about 40-50 people. The youth group may want to do a fund raiser. Trustee: Benevolence recommendations were given. Trustees met and worked on the proposed budget. Memorial: Met briefly to review year end transactions. Also, three tree's will be planted in memory of the members we lost in 2017. The security shield on both doors have been installed by Keith Leines. Also, a surface bolt lock on the back door was done. The 2018 Proposed Budget was discussed, Wes moved that it be presented as proposed by the Trustees, Kris seconded, motion carried. Pastor volunteered Bethany for the Spring Conference. Talk to Kathy Murphy regarding coffee and Cookies. Talk to Jenny about possible youth fundraiser. David made a motion to remove Mindy Piersol from the Memorial account and add Kevin Reich, committee chairman, to the signature along with Susan Knutson who is currently a signer. Mike seconded, motion carried. Recruitment of new council members is going slow. Several have been approached but have not yet committed. Survey results were available, some items will be presented at annual meeting. Pastor would like to participate in Lenten sermon series with area pastors, Approval was given. Holden Village series will again be used, this time in it's entirety. Disabled man (blind) looking for someone to drive him to services. Some discussion was given, we would like to make this happen, tabled until some research can be done. Trustees moved that the January Benevolence be split equally between Fosston Christian Radio “Shine the Light” and “Sat 7”, a Middle East radio station. Wes seconded and the motion passed. 2/11 - Allen and ? Minutes submitted by Susan Knutson. Meeting was called to order by Council President Chris Van Emmerik with roll call sheet passed out for attending members to sign. Minutes from last annual meeting were read silently by membership with Harvey Bakke making a motion to dispense with reading the minutes and 2nd by Gerald Bjorgan, motion carried. Pastor's report followed with emphasis on community service and evangelism, to invite someone to experience Bethany along with prayer for them by name, to show deep concern for their daily struggles by writing them a simple note and acknowledge the different stages of their faith journey. He also discussed his continuing education and the 500th Anniversary of the Reformation along with the Thief River Falls Conference on the influences of Martin Luther's wife Kate. Pastor Graff was followed by President Van Emmerik with her report, motion was then made by David Miller, 2nd by Lorri Ann Hartel to dispense with the reading of the Boards and Committee reports, motion carried. Treasures report was given by Sue Knutson who agreed to remain treasurer for another year. The annual budget was also presented at this time by President Van Emmerik and Treasurer Knutson. Harvey Bakke made a motion to approve 2018 Budget, 2nd by Sherry Largis, motion carried. Election of Council Members: Those members added to the ballot were: Allen Bertilrud, Sherry Largis, Sue Knutson, Ed Dahle, Cristin Gums and Gerald Bjorgan. Motion made by Kevin Reich, 2nd by Linda Johnston to cast unanimous ballot, motion approved. Suggestions for Benevolence were discussed and will be passed on to Trustees. Church survey results were discussed and various recommendations will be passed on to the church council. Will return to ushering attendees out after church services and leave the mingling to coffee time. Suggestion was made to sell old roasters by monetary donations. Kevin Reich thanked the congregation for the encouragement and support he has received for his lay person work and ministries. Linda Johnston made a motion to adjourn meeting, 2nd by David Miller, motion passed. Meeting called to order by President Chris VanEmmerick. Devotional lead by Pastor Gary Graff. Secretary Minutes for the November meeting: Motion made to accept the minutes as is was made by Darold J. and 2nd by Ann P. Motion approved. Motion made to accept the treasurer’s report as is and approve checks 11099-11114 was made by David M. and 2nd by Jenny S. Motion approved. Sunday School program 12/10/17 was well attended. Thank you Lacie H, Linda J and Sarah B for your hard work. Soup luncheon followed served by youth group. Donations received for Bible Camp Fund for scholarships. Memorial Committee met 12/10/17 to discuss future purchases and be sure thank yous are being sent. Possible purchases include brass stand for Baptismal stand and candle sticks. At this time a recommendation is made to purchase memorial tree for east side of the church. Reminder to offering counters to be sure to let Pastor know of any memorial donations made through Sunday offering. Pastor on vacation Christmas eve through New Years Eve. Kevin Reich will be preaching on 12/31/17. Wedding of Kaitlyn Cardinal and Jordan Gagner on 12/16/17. Thrivent Action team served a supper and provided personal care kits to approximately 30 clients at Care and Share in Crookston. Donkey and cart were purchased for $200.00 with the pig offering money. Survey results have been received and tabulated. Trustee: Met prior to meeting and discussed future donations. Deacons:Met to discuss and plan Christmas Eve Service. Exterior: Snow removal from Brad Johnson is going well. Interior Committee install of security shield on both front doors. Install surface bolt lock on back door. Insulating of new ducting in the attic is in process. Handicapped Parking sign an d post are in parish hall and awaiting installation. Discussed increasing the price for Smorgasbord meal. Motion made by David M. to allow WELCA to set the rates of the meal 2nd by Mike S. Motion passed. Youth group ELCA Youth Gathering in Houston summer of 2018 update was given by Jenny Schmitz. Nancy Hofstad and Jenny S will be chaperoning 14 youth to this event. They will be traveling via bus with Pathways and other churches from Northwest Synod. Fundraising update was provided. A report will be created and dispersed to church members and presented at Annual Meeting. Benevolence: Motion made by Darold J. to send $500.00 to LCMC and $500.00 to the NWMN Synod of the ELCA for December Benevolence. Motion approved. Memorial money will be used to purchase a tree on east side of church in the Spring. Plan to be sure thank yous are sent for memorials: make sure money counters drop a note to Pastor of any donations made through Sunday offering and make sure that Sue and Destiny convey information to Pastor Graff concerning contributions to the funds. Survey results were handed out. This will be discussed at Annual meeting. Discussion or if we want “Cyber Liability” insurance. Consensus was that we will not pursue this at this time. 1/14 - Diana V and LoriAnn H.
Secretary Minutes for the September meeting: Motion made to accept the minutes as is was made by Keith and 2nd by Darold. Motion approved. Treasurer’s Report: The treasures report was discussed. Motion made to approve checks number 11085 to 11098 was made by Lorri and 2nd by Hannah. Motion approved. Pastor will check with the Highway Department to get a few handicap parking spot signs. Sunday School program will be held December 10th during the church service. The Christmas Shoe box program is being organized by WELCA. The Thanksgiving service with the Prebysterians will be at our church this year. Time will be 7:30 pm. Please bring pies for fellowship. We had New Members Welcome Sunday on October 22nd. Trustee: Benevolence recommendations were given. Memorial: There was a motion made to purchase an Advent Wreath and allow the Memorial Committee to spend up to $1,500 on it made by Lorri Ann and 2nd by Hannah. Motion passed. Interior: Keith will get some exit signs for our doors. Locks have been/will be installed on the doors and we will have 10 new keys. Exterior: Pastor will contact the Highway Department and get a few handicap parking signs. Youth Group Report: We will be serving a meal for the Lions Cabinet meeting in December. The need for insulation will be put in the bulletin with a call for volunteers. We received a $3,981 donation from the estate of Doreen Nord. A motion was made to put it on the mortgage principle by Jenny S and 2nd by Hannah. Motion passed. Motion made to give $300 to the shipping of the shoeboxes, $200 to the Care and Share and $500 to the Salvation Army with a memo to keep it local made by Darold and 2nd by Diana. Motion approved. Minutes submitted by Hannah Seeger. Attended: Pastor Graff, Mike S., Keith L., David M., Gerald B., Diana V., Chris V., Lorri Ann H.
Call to order - Pres Chris V. called the meeting to order at 7:30 pm and Pastor Graff opened the meeting with Psalm 62, versus 5-8. Minutes - The September minutes were reviewed, motion by David to approve, Diana seconded and the motion carried. Treasurer’s report – Motion by David to approve check numbers 11071-11084, Keith seconded the motion and it carried. The balance in the general account is $10,351.57 and balance in all accounts is $41,576.15. Pastor's Report – Pastor Graff reported on Sunday school and Confirmation. We have 5 youth in 7th grade and 8 in 8th grade. He gave a special thank you to Linda Johnston for providing snacks. Oct 25th will be the combination youth/adult gathering at Redeemer of TRF to celebrate the 500th Anniversary of Reformation. New Member Sunday will be Oct 22 for Brandon and Bobbi Narlock and their children Bryce and Briggs. The Thanksgiving service with the Presbyterians will be hosted by Bethany this year at 7:30 pm. Bethany will be hosting pie and coffee after the service. The Christmas Shoe Box program is being organized by WELCA. Shoe boxes with a list of goods to fill them are in the parish hall. The Shoe Boxes go to needy children throughout the world through the Good Samaritan program. Our church is up to date on benevolence commitments. The Reformation 500 bookstore is now closed and books have been ordered. We get to keep the samples and they will be in our library. Pastor noted that there have been many disasters lately that it is numbing. We need to keep all these people in our prayers. Carpet cleaning - The spots that needed cleaning have been taken care of. The steam cleaning of the carpet will be held off another year. December service - Kevin Reich has offered to take the church service for December 31st as the Pastor and his family will be in Florida on vacation. Benevolence for October – motion by the Trustees to donate $500 to Disaster Response and $500.00 to the Samaritans Purse, David seconded the motion and it carried. The Interior Committee will be installing security shields on the front doors and will install a bolt lock on the back door. Keith L. will take care of this. Bethany will add one more handicap space in the parking lot. We will just purchase one more sign to be placed alongside the other spaces. Thank you to Owen Nelson for a first aid kit. It will be placed in the kitchen. Gerald B. noted that the ushers need to be reminded on lighting & extinguishing the candles. It is posted but consensus was that the Beacon Leaders should also remind them. Survey - Pastor Graff will work on a church survey over the next few weeks – it will have 3 simple questions and will be distributed with the November newsletter. The meeting was closed at 8:30 pm with the Lord’s Prayer. Meeting called to order by Vice President Chris Van Emmerick. Devotional lead by Pastor Graff. Secretary Minutes for the August meeting: Motion made to accept the minutes as is was made by David and 2nd by Keith. Motion approved. Treasurer’s Report: The treasures report was discussed. Motion made to approve checks number 11039 to 11070 was made by Hannah and 2nd by Jenny. Motion approved. There was a Sunday School Teachers meeting held and we had a great turnout. We have found all the teachers needed for this school year. Conformation will be starting next Wednesday and we will be having nine 8th graders and six 7th graders. Thank you to Keith Leines, Wes Largis and Darold Johnston for repairing items around the church this summer. Pastor will be starting a New Member’s class for two members interested in joining our church. We will wait until after Smorgasbord to steam clean the carpets. Pastor will schedule this. Pastor will be attending a two day pastor’s retreat in Detroit Lakes. Youth Group Report: We will be selling T-shirts for the Smorgasbor and also having a candy room to sell baked goods during the Smorgasbord. Old Business: We are ready for our insurance inspection. All items have been taken care of. The votes have been tallied and it was the majority vote to install an air conditioner in the church. Brad Johnson will be contracted for the snow removal at the church. Keith Lines will be taking care of changing the locks on both of the front doors. WELCA will donate $25 for every youth group member that helps at the Smorgasbord. The church council will match this donation if the member has a parent helping. Motion made by Keith and 2nd by Ann. Motion carried. It was decided that we will not be having a Christmas Day service but we will be having a Christmas Eve morning and evening service. The Deacons will be in charge of planning the Christmas Eve evening service. Motion made to give $1,000 Lutheran Disaster Response made by Hannah and 2nd by Darold. Motion approved. Meeting called to order by President Chris Van Emmerick. Devotional lead by Chris Van Emmerick. David and 2nd by Darold. Motion approved. Treasurer’s Report: There was no treasures report to discuss. Pastor talked with Sue and as of today we are covering everything and our budget is looking good. Motion made to approve checks number 11024 to 11038 was made by Wes and 2nd by Hannah. Motion approved. Correction – the estimate for the heat pump is $4,000 instead of $6,000. VBS will be held 7/24/17-7/27/17. The heat pump/air conditioner needs to be fixed. There is a leaking roof about the south entryway. LeeAnn and Curt will work on the water stain in the entryway. There will be outdoor worship for Summerfest. Pastor will ask Brodins and CL Linfoot for estimates for the heat pump and central air. He will also call an electrician to get an estimate on the thermostat. There was a motion by Mike S. made to have the trustees make the decision on the heat pump/air conditioning bids that we receive. Motion 2nd by Jenny S. Motion carried. Board of Education: Vacation Bible School will be held 7/24/17-7/27/17. Parsonage: Wes will take care of the railing item on the insurance report. They will be serving a meal during Summerfest at the vendor fair. August 9th we will be taking a group of kids to Valleyfair. There will be a parent/youth meeting to discuss the National Youth Gathering on 8/15/17 at 7 pm. Discussion was had about possible fundraising ideas. Motion made to give $1,000 to support education for new pastors through the NW MN Synod made by Wes L. and 2nd by Ann P. Motion approved. Meeting called to order by President Chris Van Emmerik. Open with devotions by Pastor Graff. A motion was made by Diana Vigstol, seconded by David Miller to accept May 18 board minutes as presented; motion approved. Pastor Graff gave a report on the 2017 NW MN Synod meeting. There was some discussion on time of year for Confirmation. Spring through fall, conflicts both times. No decision made at this time. A motion was made by David Miller, seconded by Darold Johnston to approve spending of checks numbering from 11006 to 11023; motion approved. Trees along highway have been planted. Reminder to schedule repair and updates on the insurance code violation list before 10-8-17. We have 1 heat pump needs to be replaced. Estimated cost $6,000.00. We need to get other estimates. After some discussion on ditch cleaning, and the amount of cleaning and mowing Bethany already does on a regular schedule because of our location on city roads and state highway, we probably should discontinue Bethany's responsibility for its extra 2 miles along Hwy 32. Give other organizations a chance to clean them. A motion was made by Darold Johnston, seconded by Ann Piersol, to discontinue the 2 mile ditch cleaning we have been doing for a number of years; motion approved. Benevolence: A motion was made by Diana Vigstol, seconded by Mike Seeger, to designate Care and Share in Crookston for our benevolence for June; motion approved. No further business. A motion was made by David Miller, seconded by Mike Seeger to adjourn; motion approved. Meeting closed with Lord's Prayer. Those in attendace: Chris Van Emmerik, Diana Vigstol, Pastor Graff, Ann Piersol, Darold Johnston, Gerald Bjorgan, Keith Leines. Devotions and Prayer led by Pastor Graff. Brief presentation by JoAnn Zutz on the function and needs of the Sunshine Memorial Foundation house in Grand Forks for families having loved ones with extended health care issues. Secretary’s Report: Motion by Darold, second by Gerald, to amend Secretary’s report to include Sue Knutson's name in addition to Pastor's and Destiny's signatures of “Holding Account”, motion passed. Treasurer’s Report: Motion by Keith, second by Diana to approve checks 10989 thru 11004, motion passed. Addition of $200.00 to Memorial Fund less $1,074.00 for drums and plant stand. Railings for church, fire extinguisher for garage and siding repairs to church and garage from insurance audit. Gideon and Senior Recognition Sunday May 21st. Kevin Reich and Allen Bertilrud attended Lay School of Theology course, gave good report back to Pastor Graff on subjects presented. Benevolence recommendations: May – Sunshine House, June – Sudan Relief. Motion by Darold, second by Diana, motion passed. Looking for Synod Assembly volunteers for June 9th & 10th in Moorhead. Kevin Reich would like to donate and plant tree, outdoor committee to meet and discuss variety and location for new tree. Discussed Vanco Electronic donation option for church, setup fees and monthly fees associated with service, tabled at this time. Cleaning Day for Church, setup for week of June 11th with ditch cleaning to take place before June 14th church council meeting. Discussion to change confirmation to fall time period instead of spring due to school and various other activities, consider survey to parents of eighth graders for input. Pastor's Report: First communion for 5th graders, Easter breakfast and air conditioner issues. Attended: Ann, Mike. Lorri Ann, David, Gerald, Darold, Diana, Chris, Jenny, Wes. Sue came for the financial report. Secretary’s Report - Motion by David to approve the Minutes with one correction – change Benevolence line item to read Camp Hope also, Darold seconded the motion and it carried. Treasurer’s Report - Motion by Jenny to approve the Treasurer’s report including check numbers 10972-10986, Mike seconded the motion and it carried. Sue asked permission of the Council to set up an account for special funds. This would be considered a Holding Account for events such as youth camp, etc. She will need two people on the signature card. Motion by Diana to open a new “holding” account that will be used for special projects to include the signatures of Pastor Graff and church secretary Destiny, Mike seconded the motion and it carried. Pastor's Report – Pastor spoke on Lent season, fifth graders going through First Communion class, Good Friday and Maundy-Thursday being combined for service this year. Our congregation has donated $750 in funds towards famine relief in the Sudan. He thanked everyone who has helped serve and leading in singing and playing organ. He noted we received many compliments from visiting pastors. He also went over the upcoming events with the confirmation class. A meal will be served on April 26 to the class and parents. The Church Council Deacons will be hosting and he is working on securing a speaker. Church cleaning was discussed along with encouraging those that are serving to use real dishes or paper (stay away from Styrofoam). Pastor has made a sign for the kitchen and it will be hung. Ditch cleaning will be in May – put on the agenda. Diana had a request for the youth to rake her lawn. Jenny will work on this. Benevolence for April - $500 to Life Care Center and $500 to the Women’s Pregnancy Center. Senior Recognition will be on May 21st. Cake will be served in honor of the seniors. New Member Sunday will be April 23. Aric & Amy Broden will be joining. Thank you to Gerald Bjorgan for the lovely plant stands in the sanctuary. First Communion will take place on May 7th. Gideons will be in church on May 21st. Thank you to Chris and Vicki & all the helpers for the wonderful Palm Sunday dinner . Feedback on Lent – Holden Village service. Synod Assembly – June 9-10. Volunteers? Lay Ministry was discussed. Motion by David to pay all tuition for those that are interested in attending the classes, Ann seconded the motion and it carried. The next class will take place in Fargo on April 29th. Pastor Graff noted we had a good message and Bible verses during Lent. Easter Sunday Brunch will be served. Patty Olson has agreed to head this up. There were volunteers from the council to bring egg bake, muffins and orange juice. Jenny will let Patty know who will be bringing. Closing - The meeting was closed with the Lord’s Prayer. Secretary Minutes for the February meeting: Motion made to accept the minutes as is was made by David and 2nd by Darold. Motion approved. Treasurer’s Report: February expenditures were discussed. Motion made to accept the treasurer’s report by Lorri and 2nd by Hannah. Motion approved. Motion made to approve checks number 10961 to 10971 was made by Lorri and 2nd by Hannah. Motion approved. First Communion will be May 7th. Kevin Reich will be the guest preacher while Pastor is in Florida. The Gideon's visitor will be coming in May. Pathways Bible Camp visitor will be here on Palm Sunday. We will have a New Member's Sunday soon. Marriage Enrichment Class will be ending soon. It was a lot of fun and great advice. Pastor is in TRF at St. Pauli Lutheran. Deacons: Will meet to talk about confirmation. Parsonage: Will meet to take care of the railing item on the insurance report. Memorial: Kevin Reich is the chair. Approved the purchase of refillable oil candles and an electric drum set. David Miller will get pricing on the electric drum set. Approved money for purchase and building of plant stands for the sanctuary. Will meet again in May. Interior: A meeting will be called by Diana soon. Exterior: Will meet to take care of the items on the insurance report. Motion made to give $500 to the Life Care Center in TRF, $500 to Women's Pregnancy Center made by David M. and 2nd by Hannah. Motion approved. David will contact the city about the water in the ditch. Insurance report was discussed and committees will be taking care of the things that need to be done. The Trustees met and there will be a few minor changes to the constitution. Motion made to approve Chris VanEmmerick as president was made by David M. and 2nd by Wes L. Motion approved. Motion made to approve Keith Leines as vice president was made by Mike S. and 2nd by Jenny S. Motion approved. Motion made to approve Hannah Seeger as secretary was made by Jenny S. and 2nd by David M. Motion approved. Secretary Minutes for the January meeting: Motion made to accept the minutes as is was made by Wes L. and 2nd by Darold. Motion approved. Treasurer’s Report: January expenditures were discussed. Motion made to accept the treasurer’s report by Wes L. and 2nd by Hannah S. Motion approved. Motion made to approve checks number 10937 to 10960 was made by David M. and 2nd by Jenny S. Motion approved. ● The Youth Group will go to Northern Air. Quite a few kids are already signed up. ● Pastor has 4 couples in his marriage enrichment course. ● The 5th grade communion class will be starting soon. ● The theme for Lent is The Old Testament Heroes. ● This Sunday will be Sundae Sunday. ● Trustee: Benevolence for February will be discussed at the next trustee meeting. ● Board of Education: Youth group will be going to Northern Air. Board of Ed will also meet and decide if we want to combine for VBS with St. Joseph. Darold will check with Jake Dehann for a contact. ● Exterior: Lawnmower is paid for and will be delivered in the spring. The warranty will begin on the date of delivery. ● Memorial: Memorial committee will meet February 15th at 7:00. Benevolence: Will be discussed at the next meeting of the Trustee committee. ● Discussion was had about the communion cups and how they are sometimes tough to get out. ● The Gideon’s requested to come and visit. Pastor will pick a date and let them know. ● Lent is set for March 1st. ● There will be a meatball dinner on Palm Sunday. The free will offering money will go to the Bible Camp Scholarship fund. Confirmation will be April 30th, 2017. Trustees will meet on February 23rd at 7 pm. The Annual Meeting was called to order by Council President Allen Bertilrud, on January 22, 2017 at 12:09 p.m. The roll call sheet was distributed for members to sign and is on file. Pres. Allen Bertilrud requested an addition to the agenda of the formation of a Memorial Fund Committee to oversee the acquisition and distribution of these special funds received by the church following funerals. The Annual Meeting Minutes from 2016 were distributed in the Annual Report. Motion was made by Linda Johnston, 2nd by Lorri Ann Hartel, motion approved. Pastor Graff talked about the concept of prayer-full evangelism, and reaching out to the community, which will be an emphasis for Bethany Lutheran Church in 2017. He discussed the weekly Bible study groups, and was impressed with how the Confirmation students are so willing to share their prayer concerns every Wednesday. He also mentioned the Parent/Student meals for Confirmation that have helped improve the fellowship of the youth and their families, instead of focusing strictly on academics. He participated in a number of courses throughout 2016 including a 30-hour online course on ministering to women as a male pastor, a 1-day course called Lay School of Theology put on by the Synod, a 1-day course on the Pope's view of the environment, and a 1-day course on boundaries in parish ministry. He thanked the outgoing council members for their service: Allen Bertilrud, Nancy Haglund, Bob Harmoning, Roger Harmoning, Sue Knutson, and Heidi Rewertz. He noted that 2017 marks the 500th anniversary of the Reformation and the Conference is planning an event in Thief River Falls in October. He discussed the new furnace that was installed in 2016. He said it is quick to heat and much quieter than before. He thanked Kevin Reich for overseeing the project. Kevin Reich added that he was impressed with church member Cole Seeger and everyone at CL Linfoot for their work on this project. He mentioned that the Church Council this year will be planning for the future, and looking at ways to reach out into the community and grow as a church. Congregational President Allen Bertilrud's Report: He thanked Pastor, saying the congregation is very fortunate to have a gracious, kind Pastor to shepherd us. He discusses reaching out to the young families of the community, stating the key is to listen to their needs. He said it's been a great year, and thanked the congregation for allowing him to serve. Men's Group: the Men's Bible study group is growing. Pathways Bible Camp: A meatball free-will offering meal and baskets fundraiser will be held on Palm Sunday to raise money for scholarships for Bible Camp. Treasurer's Report: Sue has agreed to stay on as Treasurer. She noted it has been a generous year. She discussed the refinancing of the mortgage which happened in 2016 to help cover costs associated with the new furnace. A 10-year note, with a guarenteed 4.5% interest rate for 7 years was signed. Election of Council Members: Ben Largis resigned from the Church Council due to schedule conflicts with the Fire Department meetings. Motion to approve Gerald Bjorgan to take the place of Ben Largis on the Council and fulfill his remaining commitment was made by Harvey Bakke, 2nd by Wes Largis, motion approved. Keith Leines and Mike Seeger were added to the ballot. Motion to cast a unanimous ballot was made by Sue Knutson, 2nd by Gerald Van Emmerik, motion approved. Presentation of Budget for 2017: The proposed budget shows an increase of 1.9%. Benevolence will remain $1,000 a month; last year additional monies were distributed due to giving away the van as benevolence in 2016. It was valued at $2,000. Some of Pastor's budget was increased to accurately match expenses for items such as travel, etc. Motion made to approve the Budget for 2017. Motion made by Kevin Reich, 2nd by Harvey Bakke, motion approved. Pres. Allen Bertilrud thanked Harvey Bakke and Jim Gilbertson for their commitment to keeping up the grounds of the church. Benevolence 2017: Suggestions for January benevolence were requested. Motion by Ann Piersol to give $1,000 to Pathways Bible Camp scholarships, 2nd by Mike Seeger, motion approved. Memorial Fund Committee: Volunteering for this new committee were Kevin Reich, Chris Van Emmerik, Marie Seeger, Diana Vigstol, and Sue Knutson. Meeting was adjourned at 12:48 p.m. with a closing blessing led by Pastor Gary Graff. Secretary Minutes for the November meeting: Motion made to accept the minutes with one change noted. Under Benevolence it should state 1000.00 to Northwest Synod not 100. Motion made by David M. and 2nd by Chris V. Motion approved. Motion to accept the treasurer’s report as is made by Wes L. and 2nd by Roger H. Motion approved. Motion to put Sue Knutson on the Memorial Account was made by Chris V . 2nd by Roger H. Motion carried. Reviewed accounts at bank, the 2016 budget, and Proposed 2017 budget. Motion made to approve the proposed 2017 budget as presented by David M. 2nd by Chris V. Motion approved. Thanks to Allen Bertilrud and Kevin Reich for leading worship when Pastor was on vacation. Alexis Hanson was guest speaker for Confirmation meal. She did a wonderful job sharing with our youth. 6-week marriage enrichment course begins this Sunday. Confirmation is going well. Kids are sharing their faith and are very open. Finishing continuing ed course titled “Shepherding Women”. This will complete his 2016 hours. Special thanks to outgoing member: Allen, Nancy, Bob, Roger, Sue and Heidi. Will use the service used in Holden Village for Lent this year. Copy machine was worked on today with improved quality of copies. Router at church was blown out during the recent power outage. Deacons : Diana reported on review of surveys. One suggestion made is to have coffee/social time for parents who are bringing children for Sunday School. Trustee: David M. reported on research for purchasing a new lawn mower. After getting quotes and talking with those who mow the church yard, the recommendation of the committee is to purchase a 54” 24 horse all wheel steer John Deer Tractor. Motion to purchase John Deer Tractor for $6900.00 using the Bethany Improvement Fund was made by Wes. L. 2nd by Darold J. Motion approved. Benevolence: Benevolence will be decided by the congregation at the annual meeting. Six council members will be going off so need to have new members. Please get names to Pastor Graff prior to the annual meeting. Annual meeting agenda to include Benevolence suggestion and memorial fund update. Thank you to all outgoing council members. Meeting adjourned with special prayer and The Lord’s Prayer. Secretary Minutes for the October meeting: Motion made to accept the minutes as is was made by Jenny S. and 2nd by Nancy H. Motion approved. Treasurer’s Report: No treasurer’s report today. Thanks to Gerald and Steve Bjorgan for removing the old electric heater. Thanks to David Miller and Darold Johnston for smoothing out the dirt in the holes around the church. Thanks to Linda Johnston for the snacks for the kids before conformation. Allen attended the “ All Things New” meeting IN TRF. Parent/student confirmation meal will be on October 19th. Pastor met with and “Insurance Inspector” – he will update us when he gets the report back from him. Trustees: Benevolence recommendations were given. Deacons: Will meet in the next couple of weeks. Board of Education: Youth group will be going to the Care and Share on December 11th and serving a meal. Interior: Carpeting in the front where the contemporary group sits needs to be looked at. Chris will look into this and the interior committee will come up with a recommendation. Allen will look into stretching the carper. Exterior: Roger and David will get a quote on a lawnmower and bring it back to the board. Benevolence: Motion made to give $1000 to the LCMC, $1000 to Northwest Synod and $1000 to the school district where Harvey Bakke’s daughter works made by Hannah S. and 2nd by Ann P. Motion approved. New Business: Discussion was had about how to involve more young couples and families. Allen discussed the 5 goals of the ELCA. We discussed adding how we want to budget our giving to this ministry in 2017 to the annual budget meeting. WELCA needs kitchen equipment and will be having a bake sale for this need. Members in attendance: Pastor Gary Graff, Allen Bertilrud, David Miller, Ann Piersol, Roger Harmoning, Bob Harmoning, Lorri Ann Hartel, Darold Johnston, Diana Vigstol, Sue Knutson, Nancy Haglund, Wes Largis. Secretary Minutes for the September meeting: Motion made to accept the minutes as is was made by Nancy H. and 2nd by Darold J. Motion approved. Treasurer’s Report: September expenditures were discussed. Motion made to accept the treasurer’s report, approve checks 10872-10887 and ACH transactions for September, made by Lorri Ann and 2nd by Nancy H. Motion approved. Sunday School is off to a great start. We have 62 children enrolled and 14 adult teachers. We have 2 confirmation classes consisting of 19 students. There will be a marriage enrichment class on October 30th, beginning at 7:00pm, featuring the work of Shaunti and Jeff Feldhahn. The class is open to all and should last about an hour. October's “Movie of the Month” will be “Angel in our House”, airing October 23rd at 7:00pm. Tickets sales for the Smorgasbord were 240, bringing in over $3,600 in sales. Thank you to Allen Bertilrud for donating a new, auto shutoff, coffee pot for the kitchen. Thank you to Gerald and Steve Bjorgan for cleaning up the trees on the point. Thank you to Linda and Darold Johnston for cleaning up the brush. Youth group scavenger hunt will be held October 23rd at 4:30pm. Thank you to everyone that attended or donated to the SONShine ministry. Over $5,000 of items and money were raised. Trustee: A review of the year thru September was done and we look to be on track for meeting our budget. Our furnace project is almost done and hopefully will come in under budget. We are hoping to have the final numbers prior to our budget meeting at the end of 2016. Exterior: There has been progress with the removing and cleaning up of brush and trees. The men's group is donating several loads of black dirt to landscape this fall. a. Sunday School and Luther League accounts at Unity; A motion was made by Nancy H. and seconded by Darold J. to remove the current signer and name Hannah Seeger and Jenny Schmitz as signers on the Sunday School and Luther League Youth Accounts, motion carried. b. We have only received 11 survey responses. It was decided to wait another month before reviewing them. c. Lorri Ann reviewed the parsonage committee's recommendations for repairs. After some discussion a motion was made by Wes L. seconded by Roger H. to replace the flooring in the basement bathroom and utility room, and to replace the kitchen window, motion carried. The council requested a bid for the two upstairs bedroom windows and for an egress window in the basement bedroom. Those repairs will be addressed at a later date. Benevolence: A motion was made to give $1000 to the ELCA Haiti Relief Effort by David M. seconded by Darold J. motion carried. a. Last year the confirmation class and their families had several evening meals followed by worship. These meals were provided by volunteers. It was requested that funding be allowed for additional meals this year. After some discussion a motion was made by Wes L., seconded by Sue K., that the funds for the remainder of 2016 be provided through the education department, and a free will offering will be requested with the funds directly offsetting the meals expenses. 2017 funding will be addressed with the budget. Motion carried. October 23rd - Allen B. and Sue K.
October 30th - Darold J. and David M.
November 6th - Nancy H. and Bob H.
November 13th - Lorri Ann and Diana V.
Meeting called to order by President Allen Bertilrud. Devotional lead by Pastor Gary Graff. Members in attendance: Pastor Gary Graff, Allen Bertilrud, David Miller, Ann Piersol, Roger Harmoning, Bob Harmoning, Chris VanEmmerick, Darold Johnston, Jenny Schmitz, Hannah Seeger, Sue Knutson, Nancy Haglund, Heidi Rewertz. Secretary Minutes for the August meeting: Motion made to accept the minutes as is was made by Sue K. and 2nd by Nancy H. Motion approved. Treasurer’s Report: August expenditures were discussed. Motion made to accept the treasurer’s report, approve checks 10857-10868 made by David M. and 2nd by Jenny S. Motion approved. Rally Sunday will be on September 18th. We will be giving away “Story Bibles” to incoming preschool students. There will be a silent action with the proceeds going to the Youth Group. The Youth Group had a very successful pool party in August. Men’s Bible Study and Women’s Bible Study are in full swing. Thank you to Vicki Duden and Maureen Hams for putting together the meal for the conformation families this month. Another “Movie of the Month” will be held in October. Trustee: Will meet on October 12th at 7:00 pm to review the budget and do a checkup. Deacons: Will meet after today’s council meeting. Parsonage: Will meet on October 5th at Pastor’s house. Interior: Need to look into lighting so that we can see the stained glass. Darold will fix the kitchen door. There will be a meeting after our council meeting today. The carpets will be cleaned after the Smorgasbord. Exterior: Allen discussed the “Point” and how to make it more maintenance friendly. Allen discussed the Church Point Renovation Project that the committee has come up with. See the sheet in our binders. Benevolence: Motion made to give $1000 to the Youth Group for the 2018 National Convention made by Chris V. and 2nd by Nancy H. Motion approved. New Business: Mindy and Sue K. will get together and get the transfer of the checkbooks to the following: Sunday School Checkbook and Account to Hannah Seeger and Youth Group Checkbook and Account to Jenny Schmitz. Pastor has people who have talked to him about wanting to spend money on trees as a memorial. There is a hole in the window in the parsonage. The parsonage committee will meet, review this and make a recommendation. Members in attendance: Pastor Gary Graff, Allen Bertilrud, David Miller, Ann Piersol, Roger Harmoning, Bob Harmoning, Darold Johnston, Jenny Schmitz, Diana Vigstol, Hannah Seeger, Lorri Ann Hartel, Sue Knutson, Nancy Haglund. Secretary Minutes for the June meeting: Motion made to accept the minutes as is was made by Diana V. and 2nd by Darold J. Motion approved. Treasurer’s Report: June and July expenditures were discussed. Motion made to accept the treasurer’s report, approve checks 10821-10856, and put the monthly amount of donations in the bulletin the Sunday after the council meeting made by Nancy H. and 2nd by David M. Motion approved. ● Starting this fall pastor will conduct a “Only for Couples” video based course for husband and wives for 6 evenings. ● Rally Sunday is planned for September 18th. ● Spark Bibles will be given to our incoming preschool children during worship hour on Rally Sunday. ● Youth group has a pool party planned for August 21st. ● Pastor will be taking vacation September 21st- September 27th. ● Thank you for all that attended Pastor’s mom’s funeral. ● A big thank you to those who helped out with VBS. It was a success with 35 children attending! ● The webpage is becoming more user friendly. ● Air conditioning is working very well. Thank you to Kevin Reich for overseeing this project. ● Keith Axvig will be visiting in September. A tentative date has been set and Pastor will contact Keith to solidify it. ● The movie “Miracles from Heaven” was well attended and provided great discussion. Trustee: Our Building Fund is right on track. Board of Education: New Sunday School materials have been purchased for all grades. Sunday school teachers will meet on September 11th at 9:00 am to go over materials and get ready for the upcoming year. Hannah and Jenny have been cleaning out the Sunday School rooms to prepare them for the new year. Hannah and Jenny gave a report on the Youth Group and their plans for the year and coming years. Some of these plans include a day of yard work, attending the National Convention in 2018 and many more service activities for our youth. The catholic church in town would like to talk about doing some youth group activities together and possibly planning to combine VBS with us next year. Interior: Will be looking at lighting so that people can see the stained glass windows during the eveing. Exterior: They will be getting together a project to do priority list and sharing it with us during our next meeting. Old Business: Surveys have been created by DeAnn L. and they look great! There will be 2 copies mailed out per household. Motion to approve the survey and administer them made by Diana V. and 2nd by Ann P. Motion approved. Benevolence: Motion made to give $1000 to the Lutheran Disaster Fund and $1000 to Lutheran World Relief made by Nancy H. and 2nd by Hannah S. Motion approved. A vote was taken about having a pot luck or just sundaes during Rally Sunday. Pot luck won with a vote of 6-3. The council will help serve the pot luck. There will be a free will donation with proceeds going to the Youth Group. A motion was made to communicate with Keith Axvig and see if September 21st at 7:00 PM works for him by Sue K. and 2nd by Lorri Ann H. There will be a free will donation. Destiny will take care of the publicity. A council member was approached by a member of our church asking that we served grape juice for communion instead of wine. Their loved one had been charged with a DUI and communicated that they believed that they are not to enter any establishments that served alcohol. Discussion was had. Allen B. will communicate with our local Sheriff’s Department to understand the law clearly so we can make an informed decision. He will report back to Pastor and he will inform the council via email. Pastor shared his knowledge on this topic and what other churches are doing. Members in attendance: Pastor Gary Graff, Allen Bertilrud, Ann Piersol, Roger Harmoning, Heidi Rewertz, Bob Harmoning, Darold Johnston, Jenny Schmitz, Diana Vigstol, Hannah Seeger, Chris Van Emmerik, Wes Largis, Visitor- Kevin Reich. Report by Kevin Reich: He has talked to Cole and the heat pumps are operational with a temporary thermostat. All of the attic work is done and the duct work is connected. The insulating of the duct work still needs to be done by the congregation. Allen needs copies of the electric work bill and the C.L. Linfoot bill to get the rebates from Ottertail. There is a water leak between the sanctuary and Sunday School addition on the wall of the entry way by the coat hangers. Someone needs to go and look at it. Secretary Minutes for the May meeting: Motion made to accept the minutes as is was made by Jenny S. and 2nd by Hannah S. Motion approved. Treasurer’s Report: May expenditures were discussed. Motion made to accept the treasurer’s report by Chris V. and 2nd by Roger H. Motion approved. There will be a bulletin board for the Pennies for the Pig donations. Board of Education will meet and look at alternative materials for teaching next year. Sample packs have been ordered. July 3rd we will have Marie Seeger’s 95th birthday celebration at the church. A meal will be hosted by her family. All are invited to attend. VBS is being planned. Peggy Miller and Linda Johnston have volunteered to head this up. Pastor will be gone July 15th-18th. Committee Reports:Trustee: Benevolence this month will go to Lutheran Hunger Appeal for the amount of $500 and Lutheran Seminary in St. Paul for the amount of $500. Parsonage: Pastor went with a low budged garage style shower for in the basement of the parsonage. Interior: We need to find that left over paint that matches. Wes will show the committee where the paint is. Exterior: They will be getting rid of the bushes and trees in the point. Benevolence: Motion made to give $500 to the Lutheran Hunger Appeal and $500 to Lutheran Seminary in St. Paul made by Chris V. and 2nd by Jenny S. Motion approved. New Business:Discuss for the future about who we are as a church and if young people do not come to your church – what can we do differently? It is time to rewrite the annual survey so that it makes more sense. We would like to work on song sheets for the new hymns. Discussion about having youth reps on the council. Some ideas of individuals would be Jaron Bernier, Freddy Landman and Madison Schmitz. Discussion was about if they should be voting or non-voting members and it was decided that they should be voting members because we respect their opinions. There was discussion about starting a Crock Pack Program. The deacons would like to be invited to Youth Group activities. Call to Order - President Bertilrud called the meeting to order at 7:30 pm and Pastor Graff led the group with devotions. Minutes - Motion by Sue Knutson to approve the minutes dated April 20, 2016 as submitted, Nancy Haglund seconded the motion and it carried. Treasurer’s Report - Sue Knutson reviewed the Treasurer’s report. Motion by Chris VanEmmerik to approve the report including check numbers 10782-10801, Wes Largis seconded the motion and it carried. * Fall outreach – looking for some new ideas. Trustees – Motion by David Miller to sponsor $500.00 for Bibles for mission work in Alaska per Alexis Hanson’s project, and $500.00 to Pathways, Roger Harmoning seconded the motion and it carried. Board of Education – Lorri Ann Hartel and Pastor Graff reviewed the meeting that was held at 4 pm this afternoon. It was noted that VBS is being worked on. Linda J. and Peggy M. will be heading it up this year and are in the process of getting the dates set. The Board of Ed is looking into different options of Sunday school material. Consensus it may be time for a change in material as the binders have been used for quite some time. It was noted another meeting will be held in a few weeks. Church website – There was discussion on how to improve the website. Overall the council seemed happy with the website but saying the website could use some improvement. It was noted that Owen’s email address will be in Sunday’s bulletin with a note of information/pictures, etc. needed. Consensus was it needs some tweaking in some areas. Pastor Graff will speak to Owen. Worship Hour – Motion by Darold Johnston to keep the worship hour to 10:00 am year around, Chris VanEmmerik seconded the motion and it carried with one nay. Wes Largis will contact Premier Sign Company to make this change on our sign. Parsonage Repair – Motion by Nancy Haglund to approve a shower stall for $700.00 or less in the basement bathroom in the parsonage, Wes Largis seconded the motion and it carried. Motion by Chris VanEmmerik to allow Pastor Graff to put in a water purification water unit at no cost to the church, Ann Piersol seconded the motion and it carried. Prayer Garden - Motion by Sue Knutson to approve the Prayer Garden that is being created at the Point, Chris VanEmmerik seconded the motion and it carried. It was noted a volunteer committee has already met. Next council meeting will be held Wednesday, June 8, 2016 @ 7:30 pm. The meeting was adjourned and we closed with the Lord’s Prayer. Secretary Minutes for the March meeting: Motion made to accept the minutes as is was made by David M. and 2nd by Sue K. Motion approved. Treasurer’s Report: March expenditures were discussed. Motion made to accept the treasurer’s report by Chris V. and 2nd by Jenny S. Motion approved. Thank you to the Deacons for serving the conformation banquet and a big thank you to those who helped with other aspects of conformation. Next Sunday will be 1st Communion for the 5th grade class. Sue Knutson will be sending out quarterly statements to Gerald Bjorgan for those members using automatic giving. Pastor will be attending the annual Concorida College Corporation meeting. Pastor plans to have a “Movie of the Month” this summer. Thank you to all those that cleaned the church. Chris V. is working on Pathways Bible Camp and scholarships for youth that want to attend. Trustee: It was decided that the council will no longer be giving benevolence to individuals or families. These requests will go through Pastor and he will be using his Good Samaritan fund for these requests. Board of Education: There will be a meeting with the members of the Board of Education on May 11th at 4:00 at Bethany Lutheran Church. Interior: Kevin Reich updated the council on the HVAC and the progress that has been made so far. The cooling aspect of the project will be completed by June 18th. He updated us on what needs to be taken down or moved. All the doors that needed to be replaced have been replaced. There was discussion about the two ton mini split AC and what to do with it. It was decided to wait until the HVAC project was completed and see if we have a need for it. Kevin has prepared 3 slabs for the HVAC units. Terry Schmitz will help pour the concrete on Friday 4/22/16. Kevin is very impressed with how the HVAC project is being run. Kevin discussed propane vs. natural gas. Please see the attached sheet for information. It was decided to have community co-op come in and give us an idea of cost for the church to switch to natural gas. Benevolence: Motion made to give $500 to the Good Samaritan Fund and $500 to Lutheran World Reliefs made by Roger H. and 2nd by Lorri Ann H. Motion approved. AA group will meet at Bethany once each month. Allen and Sandy Bertilrude will be the delegates for the Synod Convention in May. Motion to purchase oil filled candles for $500.00 from the Memorial Fund was made by Lorri Ann H. and 2nd by Chris V. Motion approved. We will have the Summerfest outdoor worship service on July 31st, 2016. Motion was made to purchase 12 gauge electrical cords with a price up to $300.00 by David M and 2nd by Hannah S. Motion approved. Pastor will be on vacation the weekend of May 14th. Kevin R. or Allen B. will possibly be his sub. Senior Recognition Sunday will be on May 22nd, 2016. Nancy H. donated a new adding machine. Thank you! It was decided to throw the old one. Pastor will bring the old laser printer to Wrights. Motion made to get a company to steam clean the carpets was made by Sue K and 2nd by Hannah S. Motion approved. We will be cleaning ditches April 27th at 4:00. All members are welcomed. Pastor will put it in the bulletin. Motion made to purchase a banner for $100.00 to advertise summer worship times from the Memorial Fund was made by Chris V. and 2nd by Jenny S. Motion approved. It was decided to table the decision about creating a banner for VBS until next time. Secretary Minutes for the February meeting: Motion made to accept the minutes as is was made by Nancy H. and 2nd by Diana V. Motion approved. Treasurer’s Report: February expenditures were discussed. Motion made to accept the treasurer’s report by Lorri Ann H. and 2nd by Hannah S. Motion approved. Board of Education: Hannah S.
Pastor’s Report: There will be a conformation banquet in April. Sherry Knott will be the guest speaker. There will be a Passover Feast for the conformation kids on March 23rd. The youth group went to Northern Air in Grand Forks in March. Hannah Seeger and Jenny Schmitz have agreed to be shared youth group leaders. Trustee: April 20th the trustees will meet at 7:00. Deacons: There will be a dinner coming up soon. More information will be presented. Interior: Will be experimenting with LED lights and will report back when they gain more information. The women’s restroom stool has a leak in the tank. Darold will look into getting a new toilet. Motion was made to approve the purchase of up to $250 for a toilet in the women’s bathroom by David M. and 2nd by Hannah S. Motion approved. Darold will be reimbursed for his expenses. New Business: Dianna suggested that we need some overall cleaning of the church. She was asking for some advice on how to get the whole church involved. It was decided that Diana will make a sheet and talk about the cleaning day during the church service. The cleaning night will be April 6th starting at 3 p.m. There was talk about the cleaning of the pew pads. Pastor will look into this and report back to the council. The interior committee will look into getting something under the advent wreath to catch the wax or change the candles. Pastor will contact a steam cleaner about steam cleaning the concrete floor and will report back to the council. There was a motion made to have the bank signature cards to include the signatures of the Treasure, President, Church Secretary and Heidi Rewertz by Hannah S and 2nd by Lorri H. Motion approved. There was discussion to have the accounts of the Memorial Fund, Sunday School and Youth Group contain dual control so that there are two people aware of what is happening on that account. There was a motion made to have dual control with the President’s name added to the Memorial Fund and Sunday School accounts and to add the active youth group leaders name to the Youth Group account by David M and 2nd by Jenny S. Motion approved. Benevolence disbursement: Reminder that the donation of the van to the New Life Center was our benevolence for February and March. Meeting called to order by Vice President Allen Bertilrud. Secretary Minutes for the January meeting: Motion made to accept the minutes as is was made by Sue K and 2nd by Heidi R. Motion approved. Treasurer’s Report: January expenditures were discussed. The bill for C.L. Linfoot was discussed and has been partially paid. Motion made to accept the treasurer’s report by Chris V. and 2nd by Hannah S. Motion approved. Pastor’s Report: Pastor attended a workshop on the Lutheran Confessionals with Allen Bertilrud and Kevin Reich. Pastor communicated that the youth group served a meal at the Care and Share and it was great. Conformation is going well. There has been some talk about having a Passover meal for the conformation students and their parents. Committee Reports: The 2016 Bethany Council Committees were formed. Please see the attached for the new committees. Memorial fund was discussed and the process of how to withdraw money from the fund. A decision was made to update the signature cards at the bank. There was also talk about having dual control and signatures on all accounts. A decision was tabled until next time and Heidi will check on the cards at the bank and update us at the next council meeting. There has been an estimate to leave the east door as is and have a push bar added for about $300 instead of having a new door installed for around $3,000. A motion made to purchase the push bar for $300 was made by Chris V. and 2nd by Diana V.
Pastor gave a report on the copy machine and the need to replace it because parts are difficult to find and Marco will eventually run out of parts to fix it. A replacement copier from Marco was discussed. It was decided to table any decisions about the copy machine. HVAC update: A check was sent for part of the current bill. Benevolence disbursement: The New Life Center in Fargo, ND would like the church van to be donated. Pastor discussed the center and the purpose of the center and their intended use of the van. A motion was made to donate the van to the New Life Center as our benevolence for February and March by Wes Largis and 2nd by Sue Knutson. Pastor will deliver the van to the center. Shared Youth Worker: Pastor will contact some more churches in the coming months about this. Conference realignment: the new conference alignment will start this month. Handicapped parking: Allen B. will talk with Kevin R. about adding another handicapped sign. Communion ware: we will try the suggested plastic cups for the communion trays. Deacons: they will get together and plan the conformation banquet that is coming up in April. The church “point”: Allen B would like us to consider what to do with the “point.” There was also talk about replacing the trees and landscaping the “point” in the coming years. Trustee meeting: a meeting will take place ½ hour before the March council meeting. Meeting called to order by President Kevin Reich. Members in attendance: Pastor Gary Graff, Kevin Reich, Linda Johnston, Roger Harmoning, Linda Hoffman, DeeAnn Leines, David Miller, Hannah Seeger, Chris Van Emmerik, Diana Vigstol, Sue Knutson, Bob Harmoning and Wes Largis. Devotional lead by Pastor Gary Graff. Secretary Minutes for December Meeting: Motion made to accept the minutes was made by Chris V and 2nd by Wes L. Motion approved. Treasurer’s Report: December expenditures were discussed and would like to see monthly the total amount of automatic deposits by members (without listing their names). Motion made to accept treasurer’s report by Linda H and 2nd by Diana V, motion approved. Pastor’s Report: Adult Sunday school class about Islam starts Jan. 17 for 6 weeks. 7th grade Sexuality and Dating class was completed with parent helper Laurie Duden. Confirmation is going well along with the meals. Discussion about if both the 8th and 9th grades will be confirmed the same Sunday or 2 different Sundays. Gary will talk to parents about this. Will need more white robes if both are confirmed the same Sunday. Trustees met to discuss budget for 2016 and the disbursement of Benevolence. New doors for Library: with the new heating system we will need louver doors to allow for air flow into the library and they will be made to swing into the library. The doors will have a narrow window so one can see into the room like the current doors. It was decided to add these doors to the amount of refinancing with the HVAC. The doors will cost about $620 each, they are solid wood and finished. Benevolence disbursement: The Board of Trustees recommend that this committee be the one to look at all requests for benevolence. There will need to be guidelines set up as to who they will recommend to receive this benefit so that we can better serve our church with this fund. Mortgage Refinancing: It is recommended to stay with Unity Bank than to go with Thrivent. Thrivent required a lot of paper work and were requiring many things that have already are done with Unity Bank. Further discussion about how we will be locked into a loan at 4 ½ % for 7 years. Motion to submit for refinancing of the church loan to lock in 4 ½ % for 7 years with a 10 year note. Motion made by Sue K and 2nd by Chris V, motion approved. Budget recommendation for 2016: The Board of Trustees discussed the new proposed budget for 2016. Motion made to approve the 2016 Budget to be presented at the Annual Meeting. Motion made by David M, 2nd by Roger H, motion approved. HVAC update: the installation will start next week on Monday January 18. Kevin will work with Linfoot to see the project to completion. Church van update: Recommendation of the Board of Trustees to sell the van. Discussion of the amount of use or lack of use since from when we first received the van. Motion made to sell the church van. Motion made by DeeAnn L, 2nd by Hannah S, Motion approved. Replacement of floor mats: Discussion of the poor shape the floor mats are by the entrance doors. Motion made to order 3 new floor mats by the entrance doors for about $100 each. Motion made by Wes L, 2nd by Sue K, motion approved. New Council Members: There are at least 4 members that will be on the ballot. Update on shared Youth worker: Pastor Gary had brought this idea to the council before. He had contacted 5 churches so far and 4 said they had no interest but one liked the idea. It was brought up about asking other churches around the area even if they are not Lutheran. This would be a shared cost between churches that we would work with. Items for Annual Meeting: Leave worship at 10 am all year around; a benevolence disbursement policy; and conference realignment and “clusters”. Minutes submitted by Linda Johnston. Members in attendance: Pastor Gary Graff, Kevin Reich, Allen Bertilrud, Linda Johnston, Roger Harmoning, Linda Hoffman, DeeAnn Leines, Nancy Haglund, David Miller, Hannah Seeger, Chris Van Emmerik, Heidi Rewertz, and Wes Largis. Secretary Minutes for November Meeting: Motion made to accept the minutes was made by Allen B and 2nd by David M. Motion approved. Treasurer’s Report: November expenditures were discussed and had a printout that showed what the balance is in all the accounts. Motion made to accept treasurer’s report by Allen B and 2nd by Wes L, motion approved. Pastor’s Report: A new community group, “Driving with Care” is using the church on Mondays. The first meal with the confirmation students and their parents was well attended (about 50 people) and the next meal will be Wed. Dec. 16. New church sign is completed and old one updated. Youth will attending Peder Eide concert in Fosston on Sun. Dec. 13. Christmas Eve service at 5:30 pm. Pastor will be on vacation from Dec 25 – Jan. 1. Kevin will bring the message on Sun. Dec 27. Communion blessing: cannot be heard by all, discussed things to do so Pastor will try doing the blessing one side at a time to see if that works better. Memorial envelopes for the church: need to look into what it would cost to have special envelopes made for our church and not to count on just the ones from the funeral home. Automatic contributions: council would like to let members know what the total monthly amount of offering comes from members that are set up to make automatic contributions, which can just be stated in the monthly newsletter. Disbursement of Benevolence: Once the council has approved where the money will be disbursed to it can be sent out right away and not wait for the minutes to be approved. Pictorial Directory: Destiny and Pastor are working to fix the printer or will have to be replaced. Once the directories are complete the members will be notified. There is more of a cost to have them printed than was first thought but once they are done the cost of replacing or adding new member pages will be less of a cost. Will ask members to make a $15 donation to help offset the initial cost. Meeting called to order by Vice-President Allen Bertilrud. Members in attendance: Pastor Gary Graff, Allen Bertilrud, Mike Mohr, Linda Johnston, Roger Harmoning, Bob Harmoning, Linda Hoffman, DeeAnn Leines, Nancy Haglund, David Miller, and later attendees Kevin Reich, and Sue Knutson. Secretary Minutes for September Special Meeting and October Meeting: Motion made to accept the minutes from both meetings, made by DeeAnn L and 2nd by Roger H. Motion approved. Treasurer’s Report: October expenditures were discussed. The loan for the parking lot was not needed that was approved at Oct. meeting. Kevin and Sue found that there was enough money from the different funds/accounts to cover the cost. There is still money in these funds and accounts that will help with the HVAC equipment. We are thankful for the contributions from our members to help to pay for these items. Motion made to accept treasurer’s report by Nancy H, and 2nd by Roger H, motion approved. Pastor’s Report: New members Sunday November 29 (2 families and 2 individuals), notified of the 2 congregations our benevolence money will help through ECLA and LCMC, confirmation had a Halloween/movie party after the Oct 28 confirmation time and a meal is being planned for Wed. Nov. 18 to start at 5:30 followed with fellowship and mid-week service. Trustees need to meet to discuss budget for 2016. Memorial Fund: Trying to connect with Mindy P. about the fund. Should we form a committee or leave it with the council; should a council member be in charge of it; and should a monthly report be submitted at each council meeting? Area east of the church: It is a lot to mow and very rough. What should be done with it? Ideas have been discussed but need to know cost of things. Could develop a five year to plan raise the money for any changes and not trying to do everything at once. Need to budget for a new lawn mower. Will need to look into who will be mowing like church member volunteers or having to pay someone to do it? Thanksgiving worship will be at Bethany again this year. The musical group “The Rusty Cords” will perform. Motion made to give them $200 for their performance, made by DeeAnn L, 2nd by Sue K and motion approved. HVAC equipment: Kevin has a 2nd bid coming and is trying to acquire a 3rd bid. Al Remick is willing to the electrical system that will need to be done and he will provide an estimate of what it cost to do the job. Church Sign: Premier Signs has one side up by the driveway and will have the other side up by the end of November. Cost is $1997 and will be paid for through the Memorial Fund. Pictorial Directory: It is taking longer to do them than was thought. The binders are costing more than what was first thought. But now when it is all set up it will be easy to update the binders when new members join, to provide them with one and make any other changes that come along. Time change: Has anyone heard of any concerns? It is a half hour earlier for Sunday School but many like the earlier church. Church is not starting right at 10 am but it will take time to see that Sunday school is out and people are into the church for the service to begin. Benevolence for November: We started a list of community people that have needs and other places that could use help. Motion was made to give $500 each to 2 different community members that are in need of help to get through some tough times, made by Linda H, 2nd by Sue K, motion approved. Members in attendance: Kevin Reich, Mike Mohr, Linda Johnston, Roger Harmoning, Bob Harmoning, Chris VanEmmerik, Linda Hoffman, DeeAnn Leines, Hannah Seeger, Sue Knutson, and Nancy Haglund. Secretary Minutes for September: Motion made by Chris V and 2nd by Linda H to accept the minutes. Motion approved. Treasurer’s Report: August and September expenditures were explained by Sue. Motion made to accept treasurer’s report by Chris V and 2nd by Mike M, motion approved. Discussion about the Money Market Fund and the Parking lot/Furnace account (renamed the Project Account). Motion made to keep $12,000 in Money Market Fund and transfer $6116.33 to the Project Account. Motion made by Linda H, 2nd by Hannah S, motion approved. Discussion about Memorial Fund: need to ask Mindy if she still wants to be in charge of it or pass it on to some else; wondering how much is in the fund; need to be sure that the money is being used as families or individuals have requested that it be used for; need to decide what group should be more in charge of seeing that the fund is being used and not but it on the shoulders of just one person. Pastor’s Report: New members looking to join, new Thursday night Bible study, new packet of ideas for women’s retreats given to WELCA, Confirmation update on classes and students, trying to have other youth events, church van did not start for last event so is it really still needed, 2 weddings officiated and thanks to all volunteers at Chad Schmitz funeral. Board of Education: Could still use extra Sunday school teachers and subs. Deacons need to meet: there are items about worship that have been brought up and to redo the survey form by using information from summer surveys. They will decide after this meeting. HVAC equipment: Kevin is trying to acquire 2 more bids so that we have 3 bids to review. Parking lot: Motion made to seek temporary financing with the bank to pay for the parking lot. Motion made by Sue K, 2nd by Roger H, motion approved. Kevin will take care of this with the bank. Brochure rack and other boards in back room: Do we keep any of it or get rid of it all? Pastor Gary felt that the rack does not get enough use. The other boards are not needed. It was decided to just let whoever wants any of it that they can have it and make a small contribution to the church. World Hunger for the children: Pastor Gary wants the children to work to collect money to purchase a pig through the Heifer Project. He has a large silver piggy bank that he will introduce at worship this Sunday. Church Signs: Pastor Gary along with Kevin’s help have contacted 3 companies about replacing the sign by the driveway and updating the one by the highway. Only Premier Signs gave us a bid. Motion made to purchase a double faced church sign by driveway and update sign by highway for $2000 from Premier Signs and use Memorial funds to pay for it. Motion made by Sue K, 2nd by Chris V, motion approved. Thanksgiving worship will be at Bethany again this year. The Presbyterians will not be able to have it at their church this year. Pastor Gary is still looking into finding a musical group to do the service. County wide multi church youth worker: Pastor Gary has heard of another area that has seen a large increase of youth participation by doing this. He will talk to other pastors in the area to see if there is any interest in our area. This way many churches share in paying the wages of a youth minister/worker. Health Insurance for Pastor Gary and family: A letter has come that his health ins. is increasing by 7% as of January 1, 2016. Motion made to continue with same Health Ins plan and allow for the 7% increase for 2016. Motion made by Mike M, 2nd by DeeAnn L, motion approved. A Confirmation meal once a month: It was discussed after Church last Sunday by some other members as how can we support our youth and show them we care about their faith. The idea was to have a meal once a month after confirmation on Wednesday to provide them with an evening meal before the church service Gary has on Wednesday. Then Gary can direct his sermon that night to the kids and this can help kids to earn their sermon notes other than just on Sundays. Linda J will work with other members to organize the meals. The meals will either be the 3rd or 4th Wednesday of the month. Benevolence for October: Motion was made to donate $1000 to a community member in need. Motion made by Sue K, 2nd by DeeAnn L, motion approved. Discussion about having a list of people, groups and other churches/places in need as to where we can distribute this money most effectively. Discussion about how we have been able to meet our benevolence every month is our faith in believing where we disperse this money is doing God’s will. President Kevin Reich called the meeting to order at 12:05 pm. Signup sheet was passed around for all members in attendance to sign. Kevin read through the handout “Bethany Lutheran Capital Expenditures”. The floor was opened up for discussion and questions. Motion was made to go ahead with the stated refinance of the church loan for repaving the parking lot and HVAC equipment. Motion made by Allen B, 2nd by Mike M, Motion carried to have a ballot vote. Ballots cast 49: 46 Yes to 3 No. Meeting adjourned. Motioned by Darold J, 2nd by David M, motion approved. Members in attendance: Kevin Reich, Mike Mohr, Linda Johnston, Roger Harmoning, Bob Harmoning, Chris VanEmmerik, Linda Hoffman, DeeAnn Leines, and Allen Bertilrud. Secretary Minutes for August: Motion made by Chris V and 2nd by Roger H to accept the minutes. Motion approved. Pastor’s Report: Attended a webinar for the new confirmation material in July and another in August on “Assimilating New Members” by Nelson Searcy. Outdoor service went well but we need to purchase some good extension cords. Six kids attended Bible camp this summer. Men’s Bible study will be starting again on Thursday mornings. He will be teaching 7th graders for Sunday school until Christmas about sexuality and dating. Confirmation will be starting soon and will include one class of 7th graders along with a second class of 8th and 9th graders. Sunday September 13 there will a meeting with parents of confirmation students. Sunday school will begin Sunday September 20. The Board of Ed needs to meet to call for teachers. There are 2 parents that have said they will teach. Bethany is to be hosting Thanksgiving service this year so Gary will look into having a group come into preform like last year. Board of Education: Need to meet to call for Sunday school teachers. Pictorial Directory: There is one more session of pictures to be taken then Destiny will start assembling them. Each family will receive one free copy unless they want to make a contribution to cover any costs in the process of making them. Survey about change in worship time: There were 3 options: 26 for 9 am SS & worship 10 am; 9 for 9 am worship & 10 am SS; 11 for 9:30 am SS and 10:45 am worship. Motion was made to start the new schedule of 9 am Sunday School & 10 am worship as of Sunday November 1st. Motion made by Chris V, 2nd by Allen B, motion approved. Major projects that were discussed: Old sidewalk will be removed and replaced by Friday September 18. Parking lot and furnace are major projects that need to be financed to be completed and now is the time to do it with interest rates being so low at this time. Allen B received bids from 2 asphalt contractors: one for $43,000 and the other for $34,000. We have accepted the bid from Minn-Dak Asphalt from Thief River Falls. They will be able to do the parking lot the end of September or beginning of October. Kevin is working to have two companies come in to provide us with an idea of what it will cost to upgrade and improve the heating and cooling throughout the church. When he has that information then we will know what it will cost to refinance the church. Motion was made to borrow the money by refinancing the church to cover the cost of paving the parking lot and the heating/cooling system. Motion made by Allen B; 2nd by DeeAnn L; motion approved. Kevin will inform the congregation this coming Sunday September 13 as to what has been proposed and what will be happening. In celebration of the RLF Lions Club 40th Anniversary they will be preforming beacon duties the last Sunday of the month: Sunday September 27. The summer survey had only 5 responses. It was decided to have the Deacons revise the survey with more specific questions then send the new survey out. Benevolence for August and September: Motion was made to donate $1000 to LCMC and $1000 to ELCA for missions to congregation fund. Motion made by Chris V, 2nd by Linda H, motion approved. Memorial money given in honor of Peter Johnston to Bethany Lutheran Church totals $440. Members in attendance: Kevin Reich, Mike Mohr, Linda Johnston, Roger Harmoning, Diana Vigstol, Chris VanEmmerik, Linda Hoffman, Heidi Rewertz, and Hannah Seeger. Devotional lead by Kevin Reich. Secretary Minutes for June: Motion made by Mike M and 2nd by Diana V to accept the minutes. Motion approved. No July meeting. Treasurer’s Report: motion made by Linda H and 2nd by Chris V to accept the report. Motion approved. Pastor’s Report: Pastor Gary was on vacation so there was no report. Board of Education: VBS went well but the number of children attending was less (20-25). Need to meet to call for Sunday School teachers. Rally Sunday will be September 20th. Pictorial Directory: several families have had their pictures taken and more are signed up to have their pictures taken for the directory and families or individuals could submit their own picture. Change in worship time. There are members that have been discussing making a time change so that we are done sooner. We need to survey our members to see what they think. There will be 3 options: 9 am SS & worship 10 am; 9 am worship & 10 am SS; or leave it at 9:30 am SS and 10:45 am worship. Any change will not happen until January 2016 or later. Sidewalk, parking lot and furnace are major projects that need to be financed to be completed. Discussion to refinance the church loan to cover these costs with the interest rates being so low at this time. Alan B was going to check with a couple asphalt contractors but did not have that information back to let Kevin know what he found out. Kevin checked with a couple different contractors to find out cost of concrete and labor. Need to raise level of sidewalk before overlay of parking lot can be done. Sidewalk will cost at least $1000 for the concrete plus $1000 - $1500 in labor. Could do it for less if we have volunteers to help cover labor costs. Motion made to replace sidewalk in front of church with a 2” rise costing from $1000 to $2500. Motion made by Chris V and 2nd by Diana V, motion approved. Kevin is still trying to acquire more information on costs to replace furnaces along with trying to provide AC in the church sanctuary. It was brought up to look into replacing the back door because you cannot use it as an emergency exit so it should be a push bar exit. WELCA information for the council: Summer Fest Cake Walk went well and raised about $100. They have purchased some new glass cups and plates and were able to find a good wood cabinet at Wright’s Consignment to store them in. The cabinet will sit in the room next to the kitchen and Gerald Bjorgan will added a couple of shelves and add doors to enclose the rest of it. Benevolence donation for July: Motion made to donate $1000 to a local family. Motion made by Chris V, 2nd by Linda H, motion approved. The August benevolence will be tabled to next month at this time. Secretary Minutes for May: Motion made by Allen B and 2nd by Mike M to accept the minutes. Motion approved. Treasurer’s Report: motion made by Chris V and 2nd by Wes L to accept the report. Motion approved. Pastor’s Report: Attended a Mental Health First Aid workshop for teens, which was very good. There are 6 children signed up to go to Bible camp so far this summer. There were 8 members to help with the cleaning the ditches, which went well. The new Communion trays will be here soon. Board of Education: VBS will be July 27 – 30 and Peggy Miller and Linda Johnston will be in charge. Interior Committee: Went over the list of items removed from the library after the room was painted and bulletin board and white board was hung back up on the wall. Motion made to offer the book shelf that Vic Nord made to the Nord family to see if they want it. Made by Diana V, 2nd by Linda H, motion approved. Will offer the 2 brown tables to the members as to who would want to purchase them. Wes L said that he would like to purchase one of the tables. So it will be just to offer one of the tables. The padded folding chairs will be moved into the 2 Sunday school rooms by the Gathering room. Pictorial Directory: Destiny will start taking pictures this summer and will notify members of when it will start. Church Secretary: Starting in June Destiny will be working mainly on Thursdays and do those extra things on Mondays when church is generally closed. Discovering Hope Workshop is June 27, 2015 in Moorhead. If there is anyone able to go let Pastor Gary know and he will get you signed up to attend. Color Laser Printer: Now is the time to buy one with it on sale and will need it for the Pictorial Directory. Motion made to purchase the Printer for $179. Made by Wes L, 2nd by Mike M, motion approved. Vacation dates for Pastor Gary: July 2 – 9 and Aug. 11 – 18. Gary will be sure to have someone cover for Sunday July 5. Trustees will need to meet in June or July to review the budget for the first half of the year. Benevolence donation for June: Motion made to donate $500 to Care and Share. Motion made by Allen B, 2nd by Chris V, motion approved. Motion made to donate $500 to RLC Social Services Emergency Fund. Motion made by Chris V, 2nd by Wes L, motion approved. Greeters: we need to remind ourselves as members to be greeters to all who come to our church to worship so that they feel welcomed here. Flowers for alter: It was asked that a signup sheet be posted for members who have flowers that they would like to bring in for display to see what Sundays are available. July council meeting: Unless something important comes up there will not be a meeting in July. July 26 Diana V and ? Discussion of those people in our community that need our prayers and support. Secretary Minutes for February & March: Motion made by David M and 2nd by Diana V to accept the minutes. Motion approved. There are no minutes for April because there was no meeting. Treasurer’s Report: motion made by David M and 2nd by DeeAnn, to approve as printed. Motion approved. Pastor’s Report: Took part in a confirmation webinar and there will be a part 2 this summer; trying to set a couple of youth outings for this summer; confirmation students helped clean up around the church outside; working with other confirmation students to finish the requirements to be confirmed. Deacons: the confirmation banquet in April went really well and Terri Cuppet was the quest speaker. Made adjustments as to who are the standing committees: DeeAnn L removed from Parsonage/Van Comm. (She was on 3 committees). Chris V added to the Interior Comm. ( she was only on one committee). Interior Committee: Met to start looking at what needs to be done around the inside of the church. There is money available to purchase new lighter weight tables with smooth writing surface for the library. Need to look into purchasing new chairs for the library. The moveable white board is not moved around a lot so it will be mounted on the wall next to the bulletin board in the library. There are many areas/rooms that need paint. Need to meet again to further discuss items that we did not have time to get to. Exterior Committee: Has been suggested to look into how we can make the pump house look better on the outside and not have to continue to find straw bales to cover it during the winter. Sound board is back and working. David M paid the fee and bought a used adjustable chair to use when at the sound/computer system. David will submit bills for reimbursement. Ditch cleaning: Wed. May 27 starting at 6:30 pm with Thu. May 28 as the alternate date. Church Secretary: Pastor Gary sees a need to increase Destiny’s hours to complete the many tasks that she is asked to do that she is not able to complete monthly. They plan to change from Wednesday to Thursday for her to be at church so that items that come up at council meetings and with other church groups has a better chance of being added to the newsletter and bulletin. Council agreed to increasing the church secretary’s hours. New Communion Trays: The current communion trays are showing wear and tear so a new set of 4 trays and cover are needed. All the other trays would be kept for those times when we need more like Easter and Christmas. Motion made by Chris and 2nd by Diana to purchase 4 new communion trays with cover for $250 or what is need to cover the cost from the Memorial Fund. Benevolence donation for half of April and May: Motion made by Chris and 2nd by Linda H to donate the $500 of the other half of April benevolence to the Back Pack program in RLCC. Motion approved. Motion made by Linda H and 2nd by DeeAnn to donate the $1000 May benevolence to a family in need in the community. Janitors find that after some current events they have had to do some extra clean up. Council will have it posted in the newsletter to remind members to take time to clean up after any event they are involved in. New tables: Motion made by Diana and 2nd by Hannah to purchase 4 new light weight 6 foot smooth writing top surface with the $300 donated to purchase them with. Motion approved. New chairs for library: Motion made by Chris and 2nd by Diana to purchase 20 new chairs for the Library at $20 each from the Memorial Fund. Overhead garage door opener: Motion made by Diana and 2nd by DeeAnn to allow the Men’s group to purchase an overhead garage door opener with money that has been donated to the group. Motion approved. Meeting adjourned with prayers for those people in our community in need of prayers followed by The Lord’s Prayer. Secretary Minutes for February were not available. Treasurer’s Report: motion by Nancy, 2nd by DeeAnn, motion approved as printed. Pastor’s Report: Finishing the Sunday morning Bible study which went well, the 5th Graders will be starting Communion classes Match 22, Sunday March 15 the youth will be going to Grand Forks for a fun event, the sound board is in need of repair and has to be sent to the company for the repair – unsure of when we will have it back. Committee reports: none at this time. Strategic planning meetings will wait to be scheduled after Easter. Pictorial Directory: Destiny said she would be willing to help with it. She would take the photographs and help to assemble the spiral notebook. The pages will need to be printed in color on cardstock paper and to use a good printer. It will need to be looked into as to where we will be able to have the pages printed. Auditor’s report: Heidi Rewertz and Harvey Bakke complete the audit of the church books and they balanced. Discussion about items around the church: paper towel dispensers will always be a slight problem when you have layered paper towels; the old brown vacuum needs to be thrown since the prongs are broken and does not work; there are 2 smoke detectors and who checks them and should it be looked into having it hooked into the phone line to notify someone if the smoke alarms go off, Pastor will contact Garden Valley for information. Constitution and By-laws: need to have updated versions put into all council members books. Easter breakfast will be organized by Vicki Duden and Maureen Hams. It will be served between services on Sunday April 5th. The proceeds will go to the Chad S. Benefit. The 2 church services at set for 7:30 am and 10 am. Benevolence donation for March: Motion made to wait until April to decide on what to do with both March and April benevolence. Motion made by Allen, 2nd by Nancy. Discussion about waiting since we were unsure of who or where the contribution should go to for March. Motion approved. Meeting adjourned with The Lord’s Prayer. Minutes submitted by Linda Johnston. December 2014 and January 2015 minutes: motion to accept as printed by Allen, 2nd by Steve, motion approved. Treasurer’s Report: motion by Allen, 2nd by Diana, motion approved as printed. Pastor’s Report: There was $1004 raised for Care & Share from the Basket Give Away and potluck in February. Had a good turnout of youth and adult volunteers to serve a meal at Care & Share in January. Sunday morning Bible study is going well. Lent services need groups to service. Parsonage Committee: Kevin and Spencer will work to finish fixing the ceiling in the parsonage. Deacons will need to plan a Confirmation dinner before Sunday April 19 when the 9th graders will be confirmed. Strategic planning or council brainstorming: Allen B will head set up the Strategic planning committee to set up meetings and help prioritize items in need of major repairs around the church. Pictorial Directory: It has been a few years since the last one. We will look at trying to do it in house and approach Destiny for her help and any other member that could help. Youth Representative to be on council. A motion was made to ask Jayde Sandberg for a one year commitment to be that youth rep on council. Motion made by Chris, 2nd by Diana, motion approved. Pay off church mortgage: discussion about refinancing the church mortgage to help complete the major projects that were discussed before. Trustees will need to meet to look into the financial part. Altar cloth: discussion to enhance the altar cloth. Motion was made to make enhancements to the altar cloth up to $300 from the Memorial Fund. Motion made by Chris, 2nd by Diana, motion approved. Benevolence donation for February: Motion made to make a donation to Pathways. Motion made by Chris, 2nd by David, motion approved. Present: Kevin Reich, Pastor Graff, Marion Bjorgan, Rachael Largis, Allen Bertilrud, Nancy Haglund, Spencer Oland, Linda Hoffman, Linda Johnston, DeeAnn Leines, Roger Harmoning, Steve Hams, Mike Mohr, Deb Rewertz and Heidi Rewertz. Meeting was called to order by President Kevin Reich. Devotions were led by Pastor Graff. The Secretary’s minutes of the December meeting were tabled. The Treasurer’s report was approved upon a motion by Marion, seconded by Linda Johnston. Motion carried. Woodpicks have been contacted regarding the last Sunday of July and they are already booked for that date. Pastor Graff informed the Council that Bethany is a member of Pathways Bible Camp Corporation. Congregants on automatic deposits are not getting recorded as Gerald and Marion do not have access to this information. There was a motion by Allen, seconded by Roger to grant access of reports to Gerald and Marion to enable them to record these deposits. Council Brainstorming Session – was held January 11th to start the process of strategic planning for the Church. Strengths, weaknesses, opportunities and threats to the Church were discussed with points being listed under each category. It was suggested that council members review this list and future meetings will hold discussion on prioritizing and coming up with timelines for such items. Additional business items for the annual meeting – none. 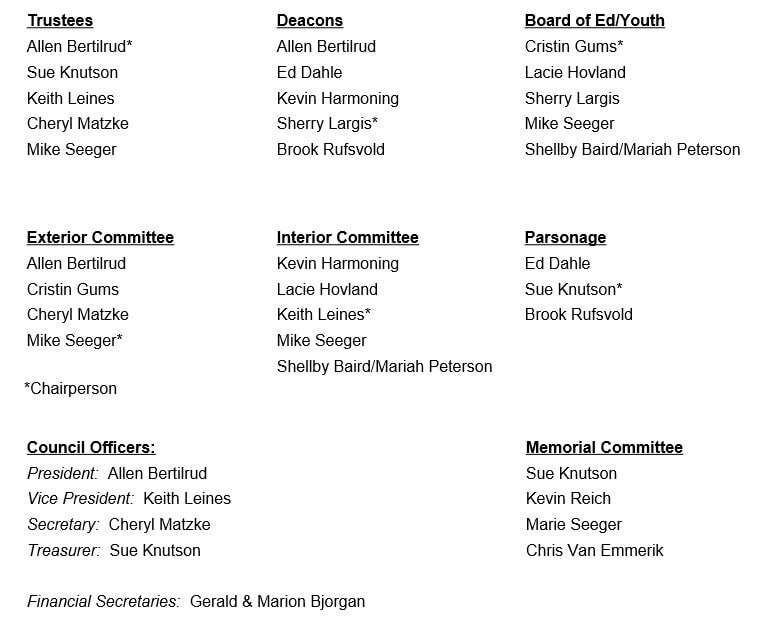 New council members – have a few names but please call around and try to get more names for the annual meeting. Benevolence for January: There was a motion by Linda Hoffman, seconded by Deb Rewertz to grant $1000.00 to the Violence Intervention Project. Motion carried. A new Bible study on the Gospel of Mark will begin January 18, 2015 from 9:30 – 10:30. February 1st the Youth Group will be serving at the Care & Share in Crookston. Bethany has received Thank You cards from the Food Shelf and the Salvation Army. Education: Helpers are needed for Wednesdays during Confirmation. There is a sign-up list in which to volunteer. Trustees: Met and prepared a budget for the upcoming year (2015). This budget was reviewed and approved upon a motion by Allen, seconded by Mike. Motion carried. This budget will be shared with the congregation at the Annual Meeting on January 18th. 2/01: DeeAnn and Linda H.
2/15: Steve and Linda J.